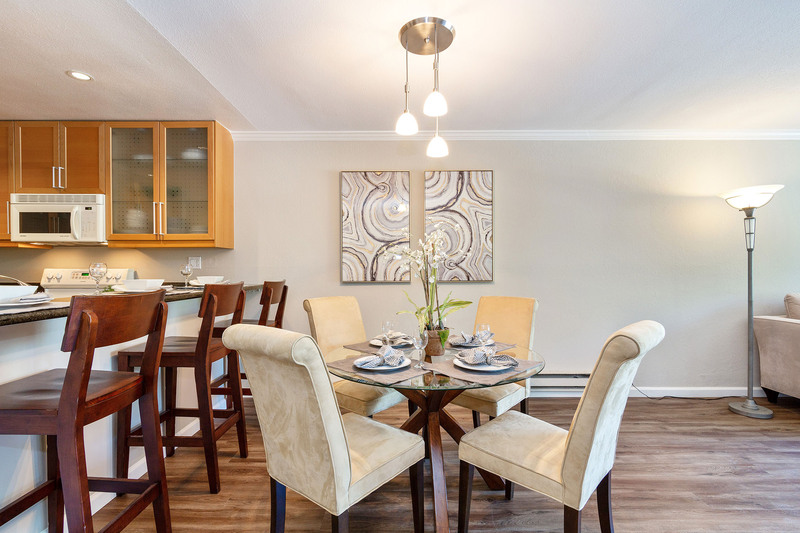 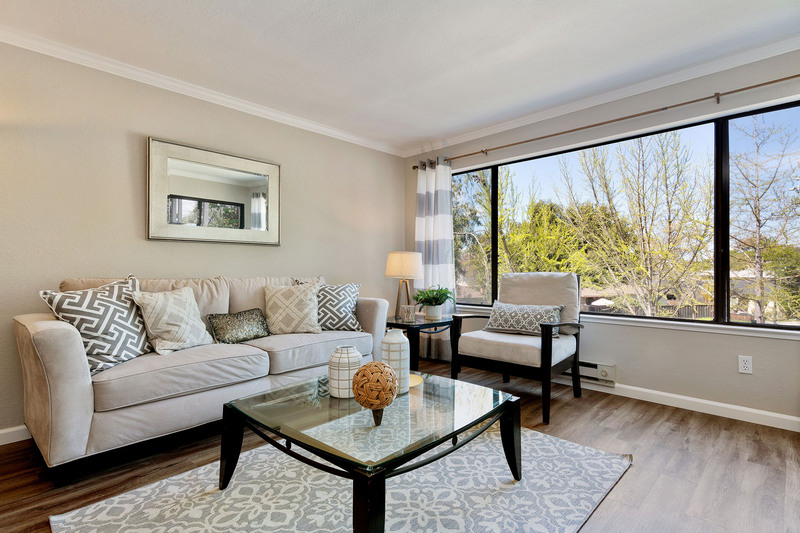 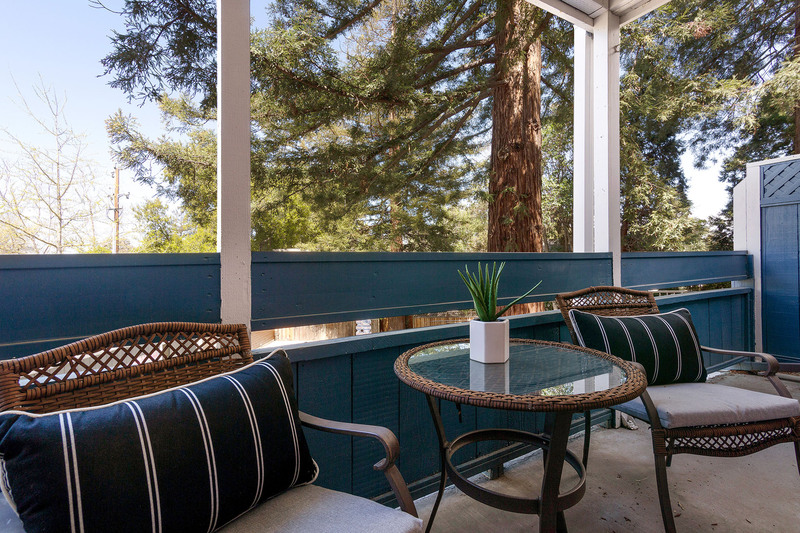 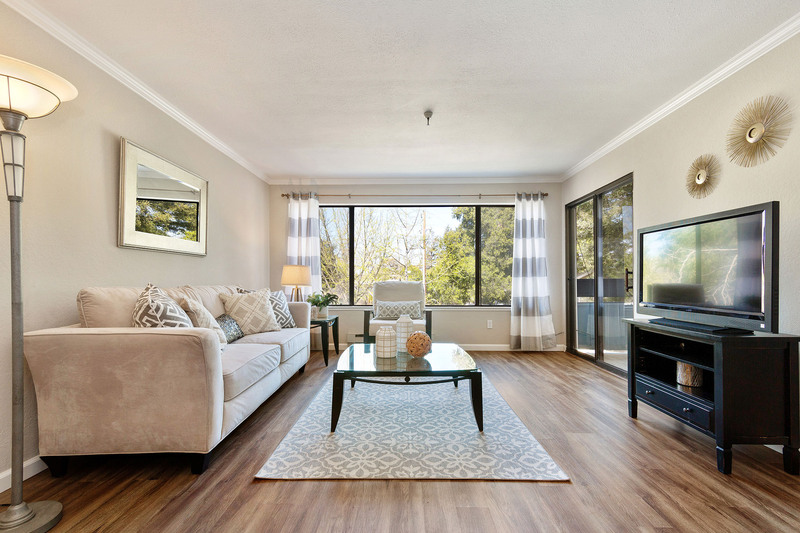 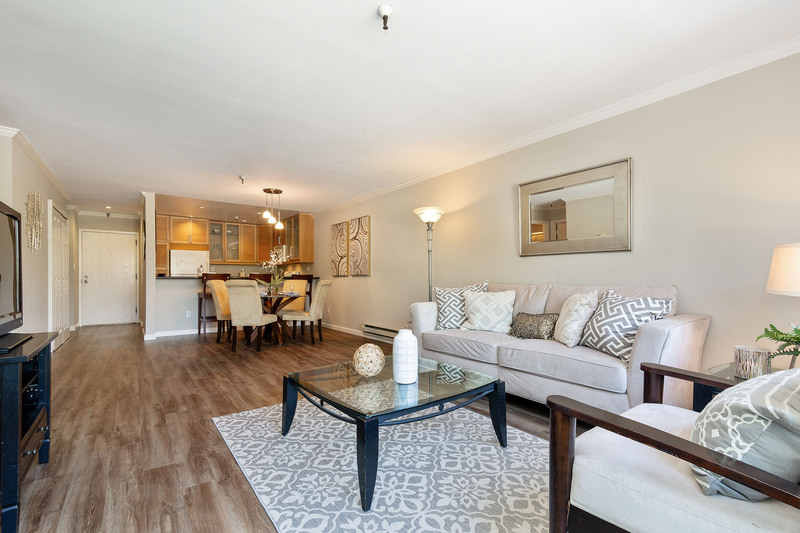 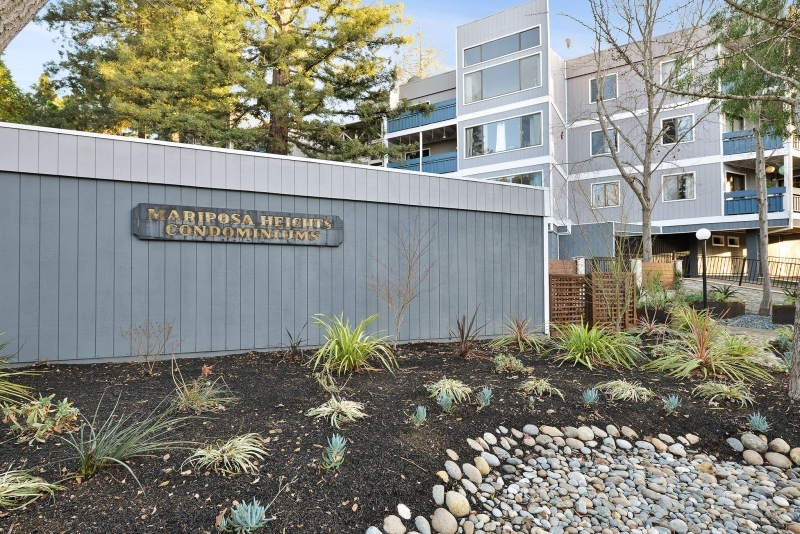 Welcome to your blissfully updated Mountain View Condo. 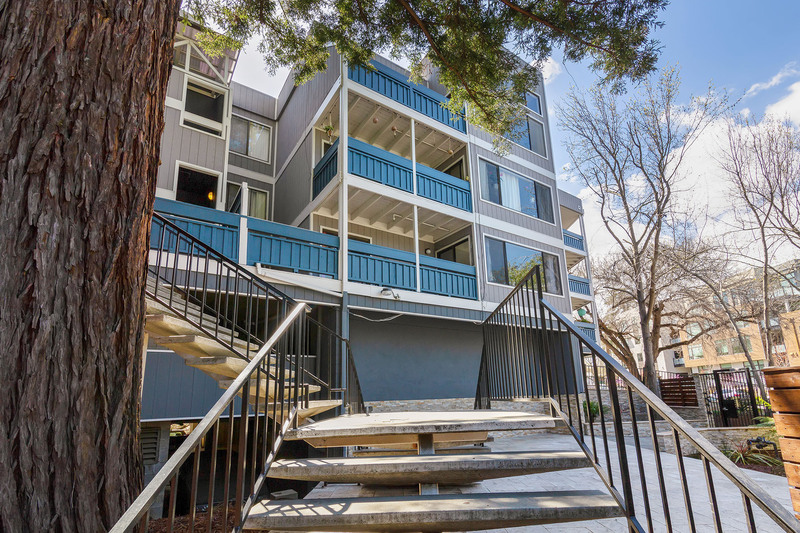 These very rare condos do not come on the market often. 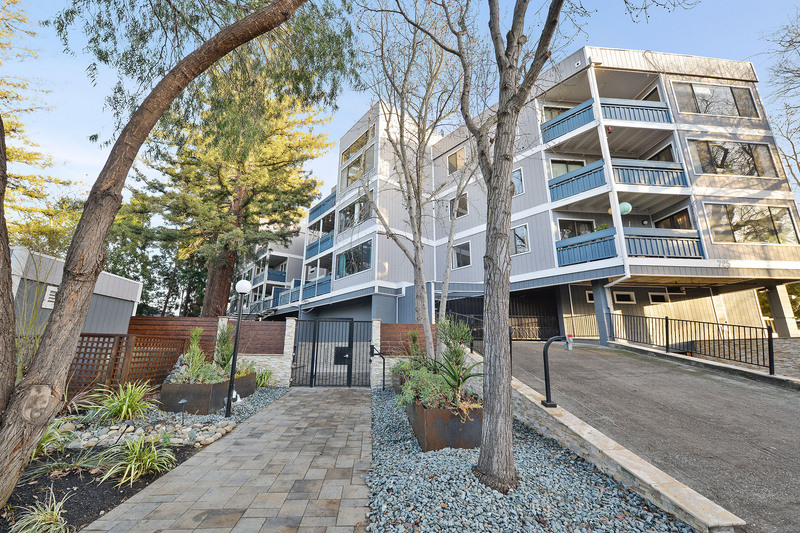 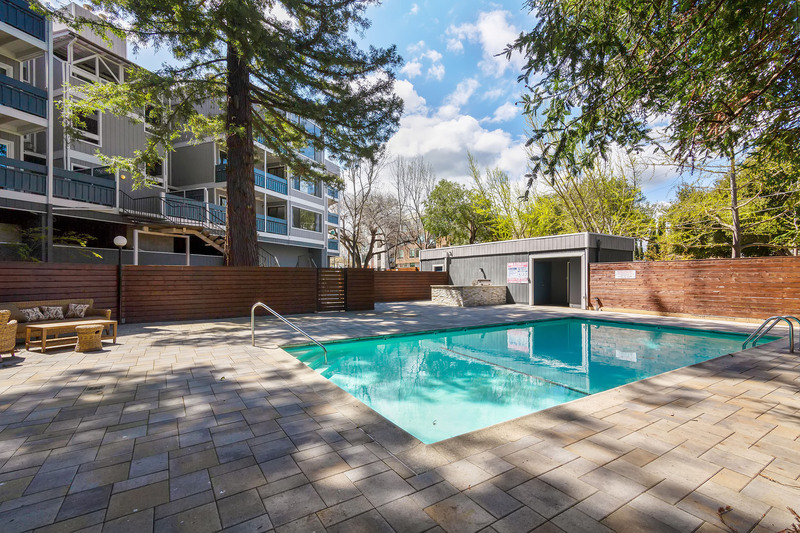 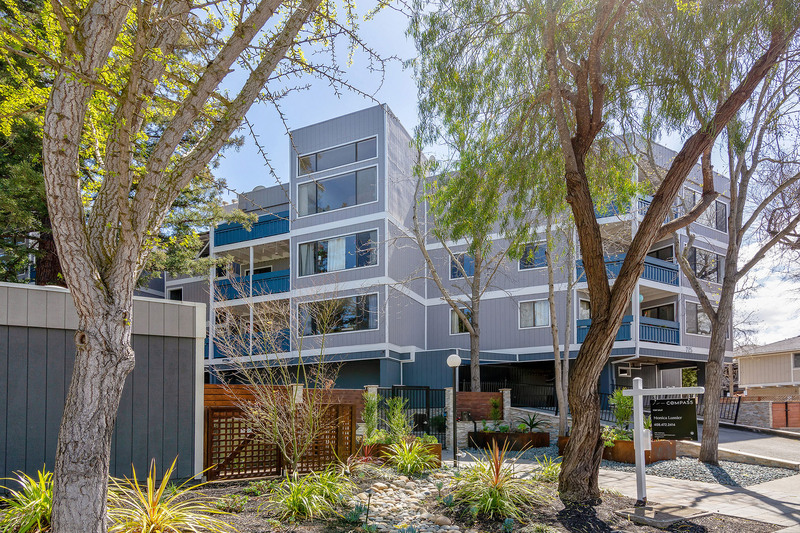 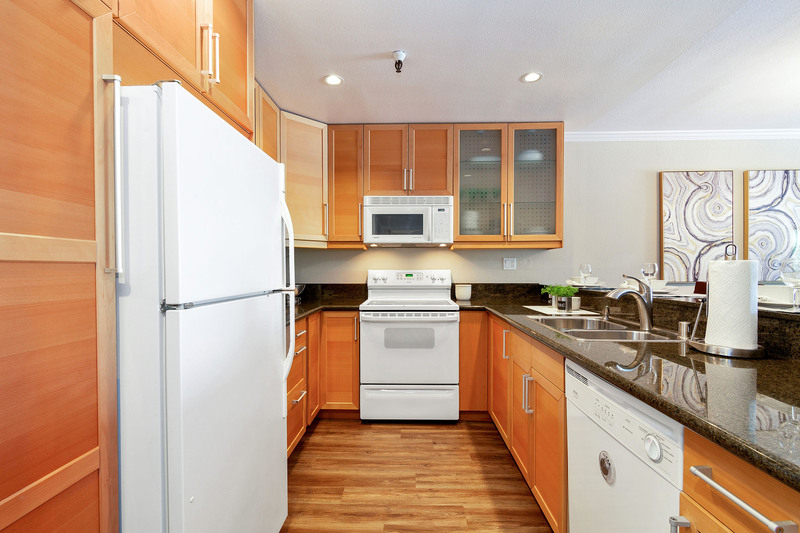 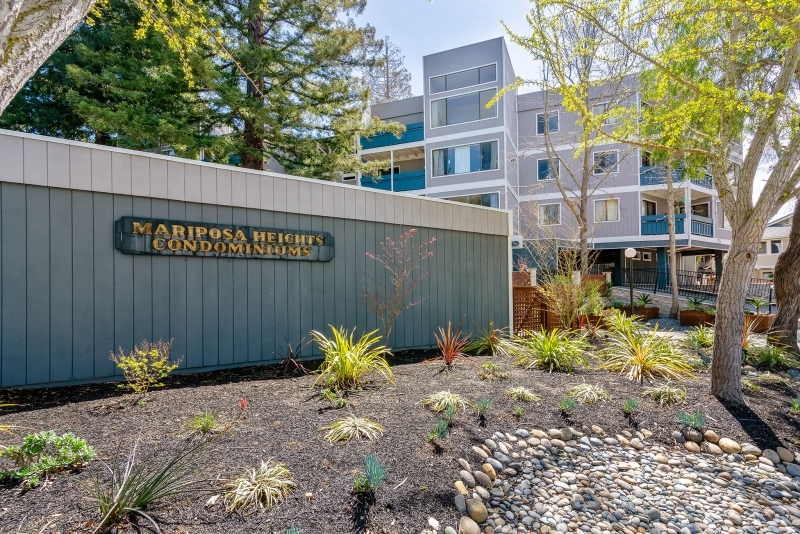 This spacious two bedroom / two full bath condo is directly in the heart of Mountain View in a secured building. 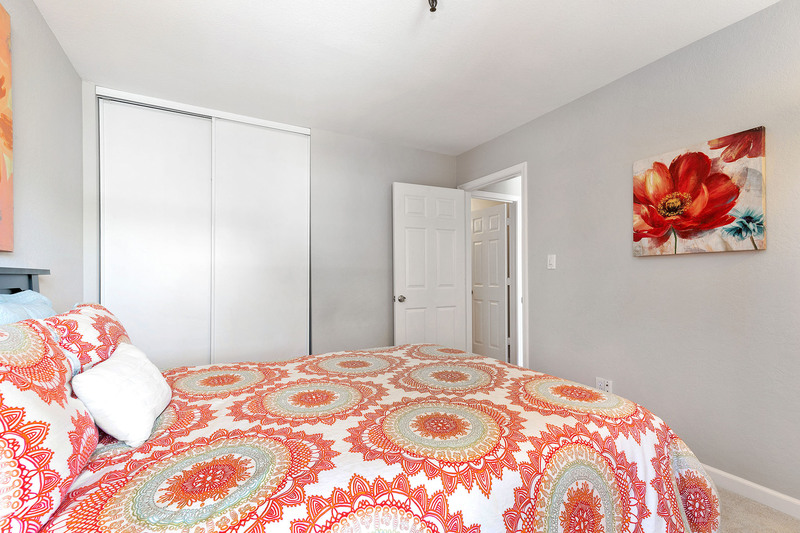 You have two large deeded parking spots along with two storage sheds in the gated garage. 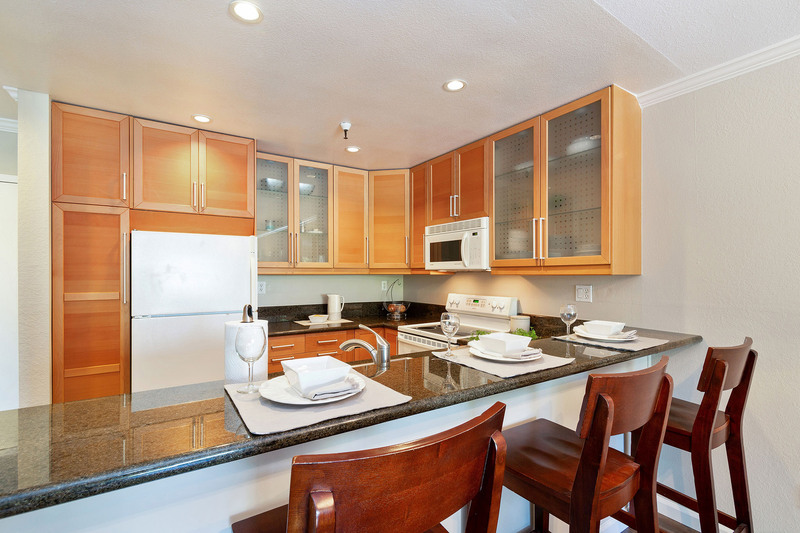 This condo is equipped with two ample bedrooms that can both be considered masters. 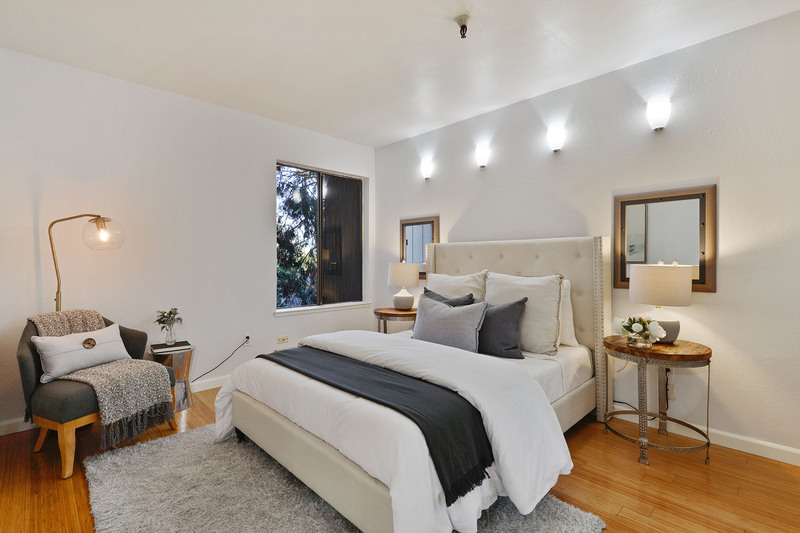 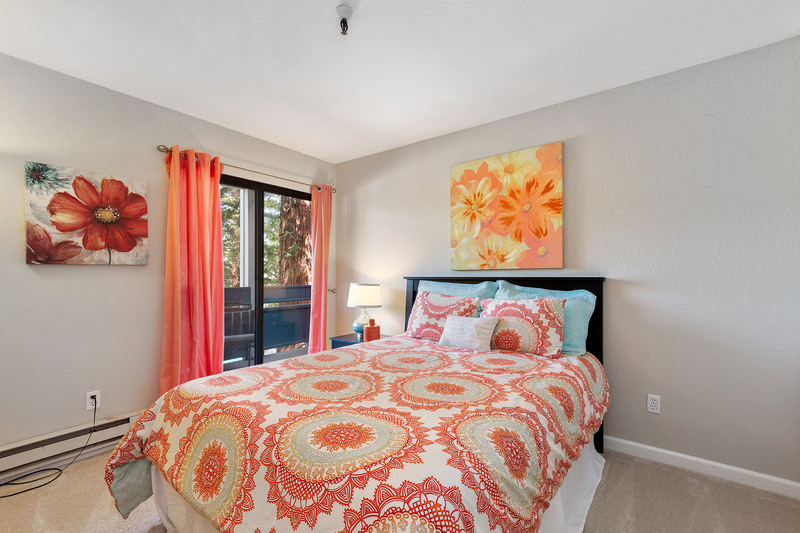 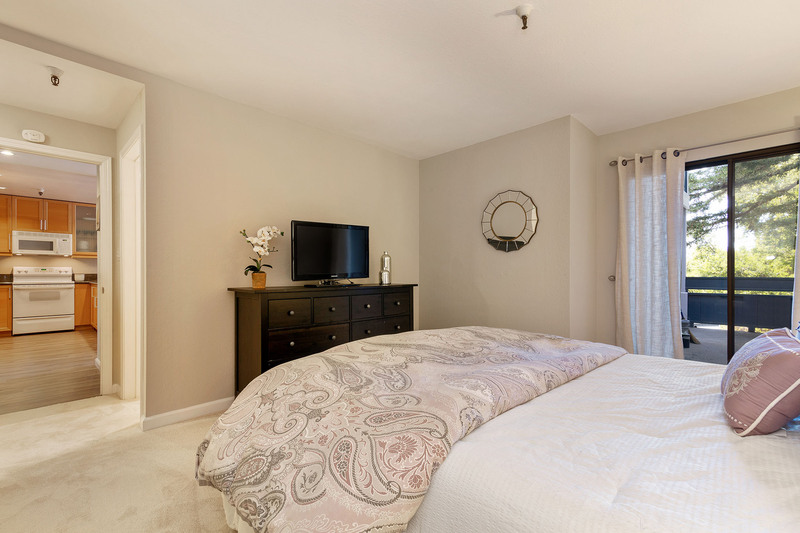 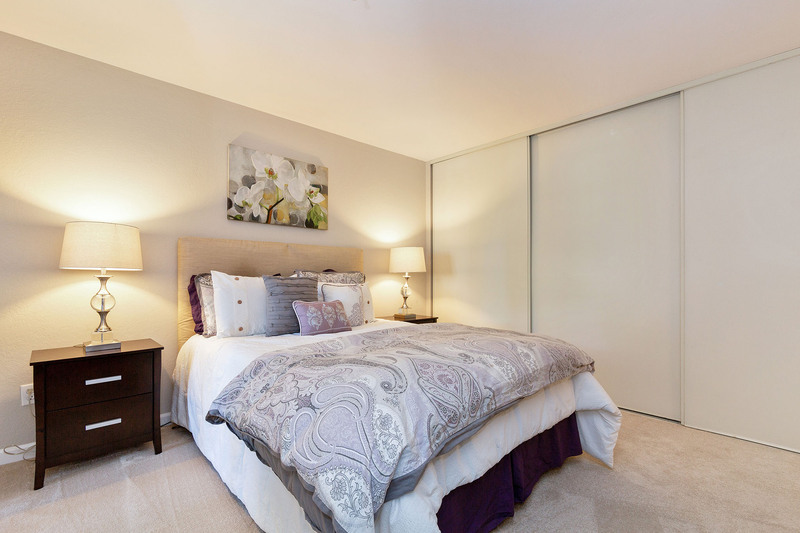 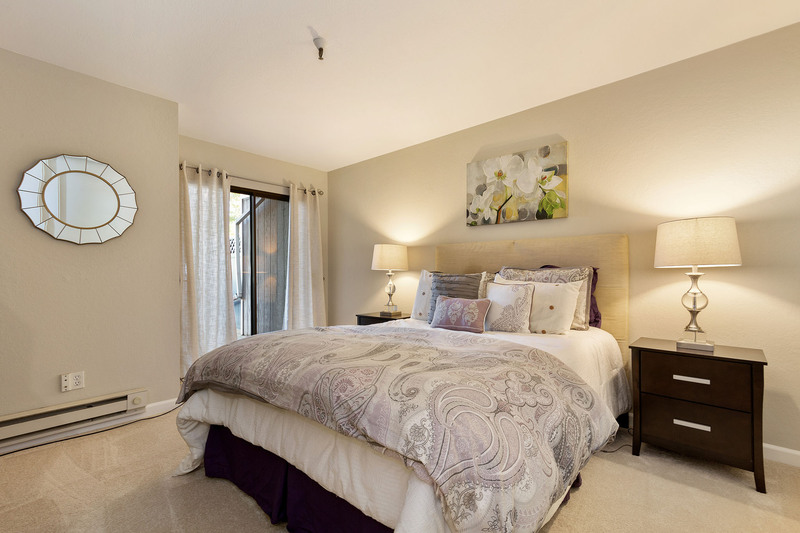 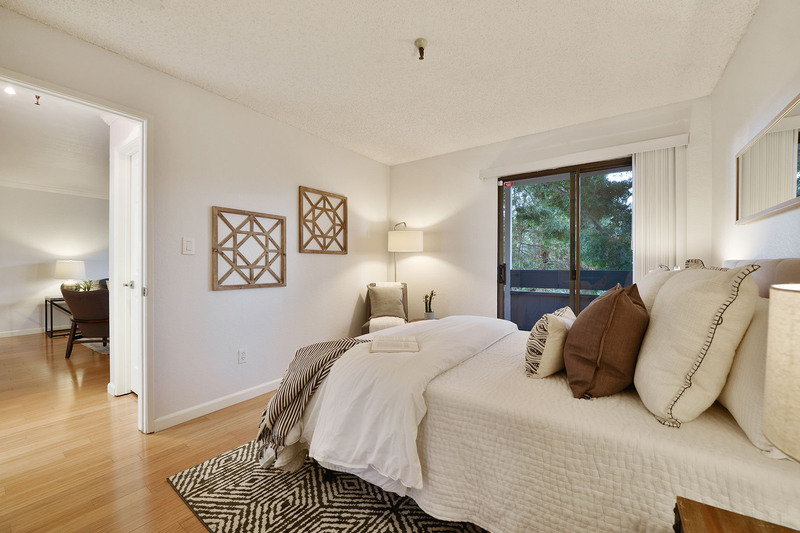 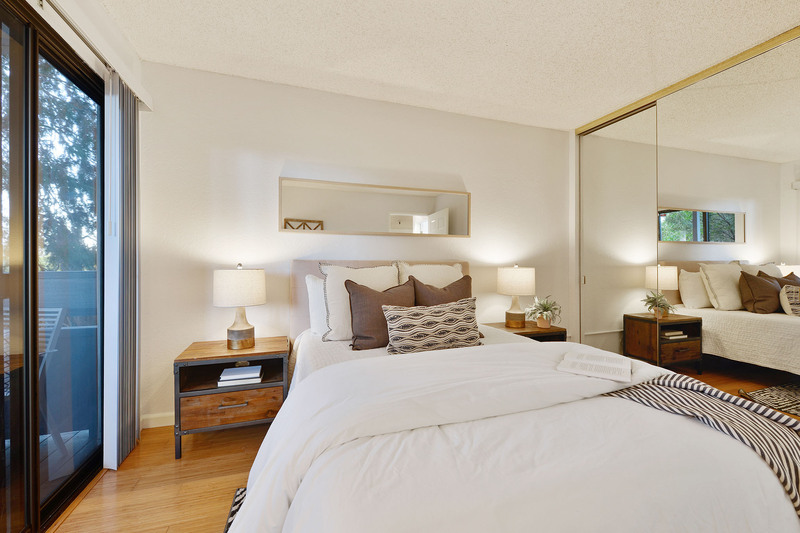 One generously sized master bedroom has an en-suite bath along with ample closet space and plenty of natural light. 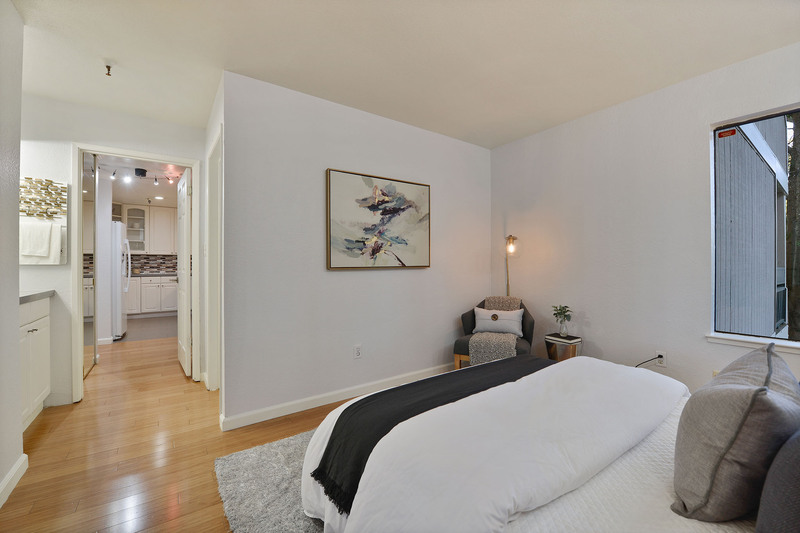 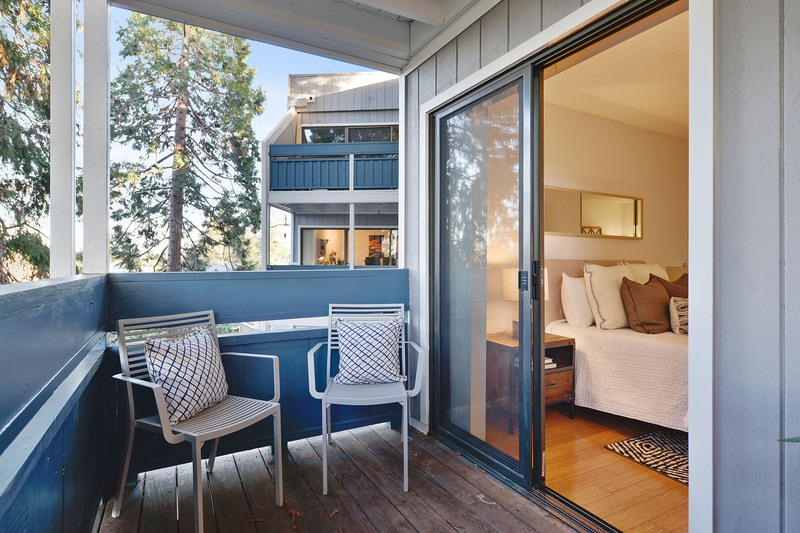 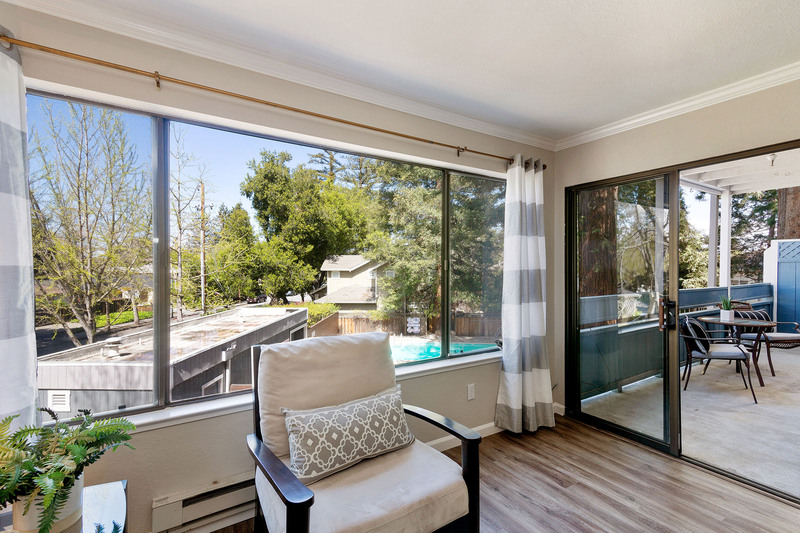 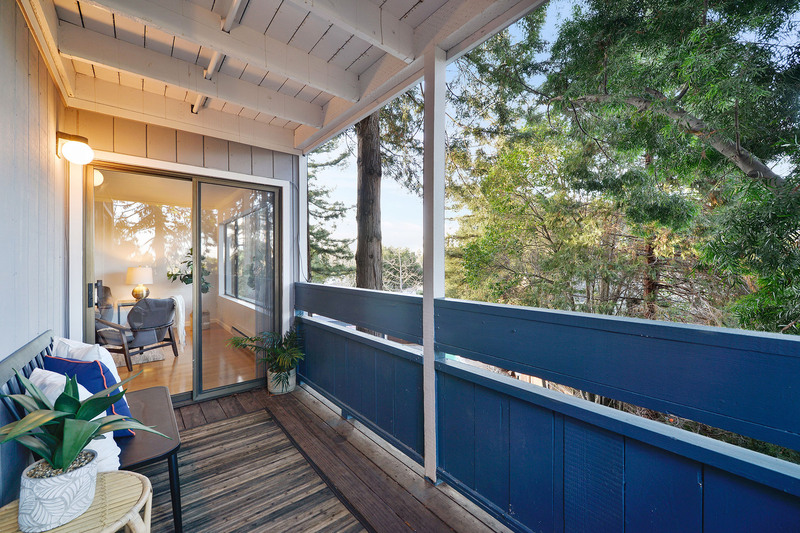 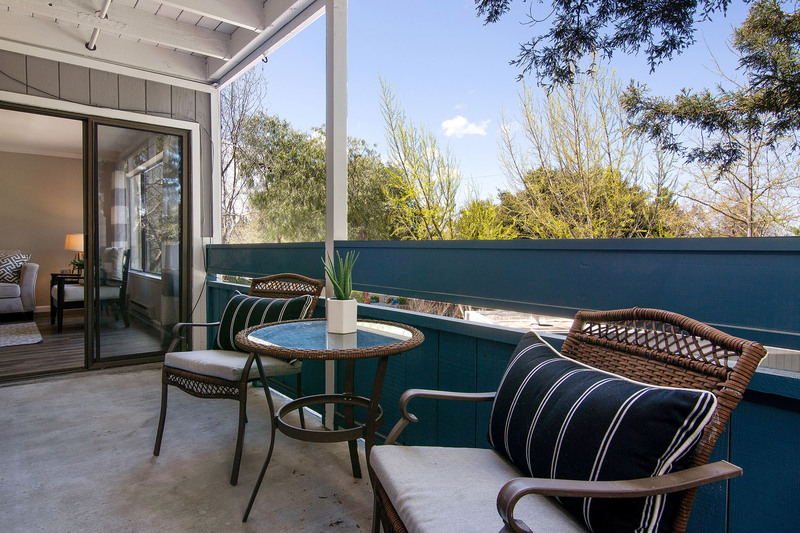 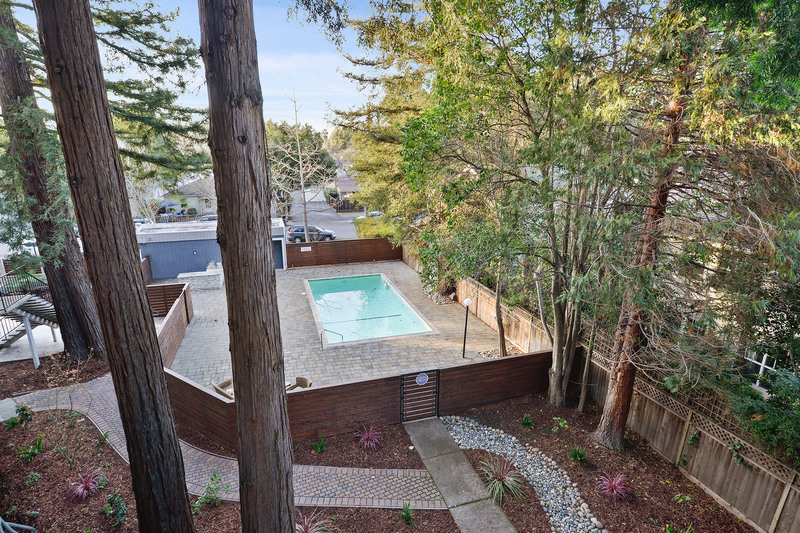 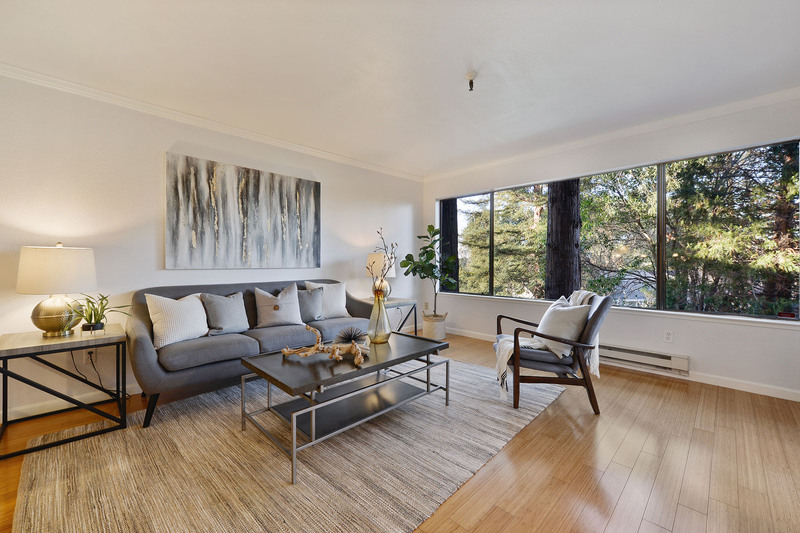 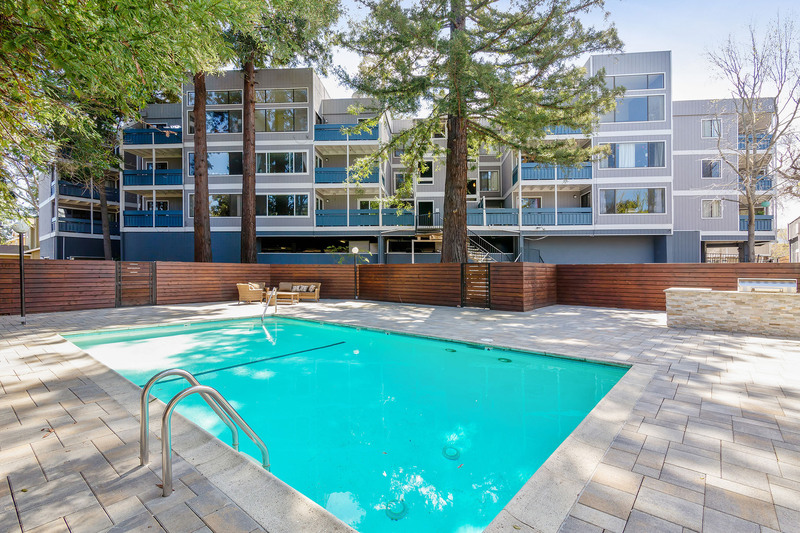 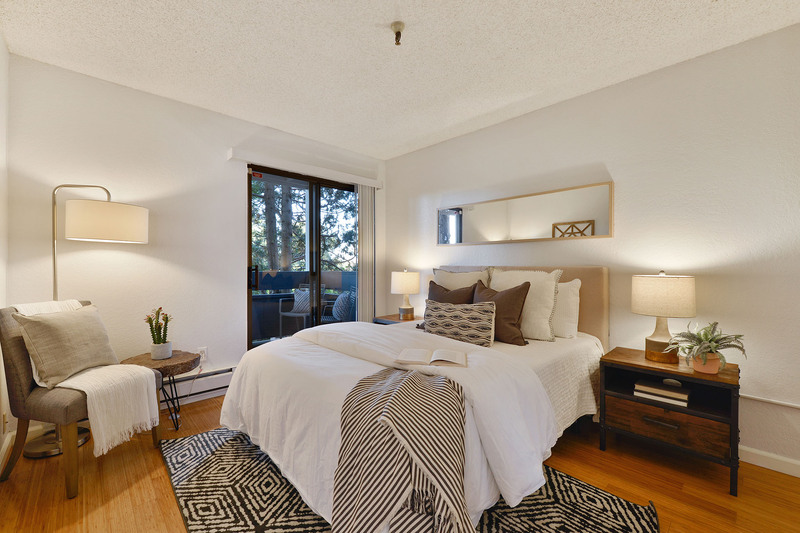 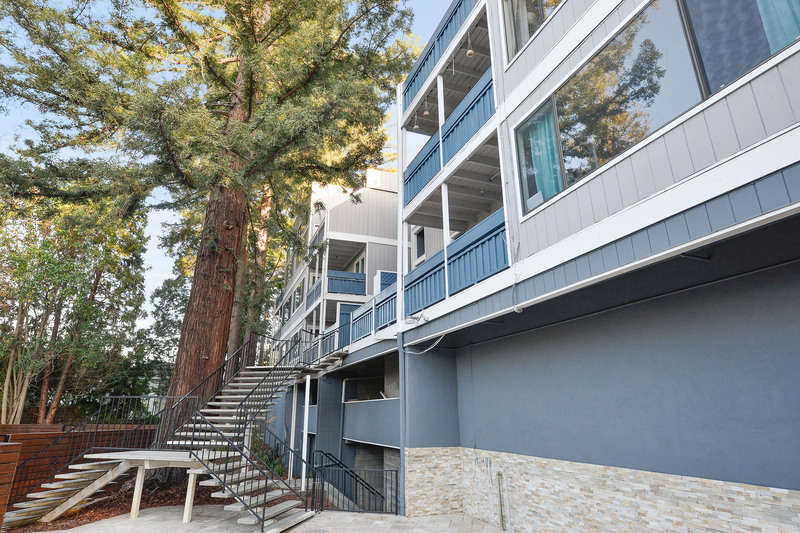 The other bedroom has sliding door access to your private balcony overlooking the mature redwood trees allowing you to absorb the serene and tranquil atmosphere. 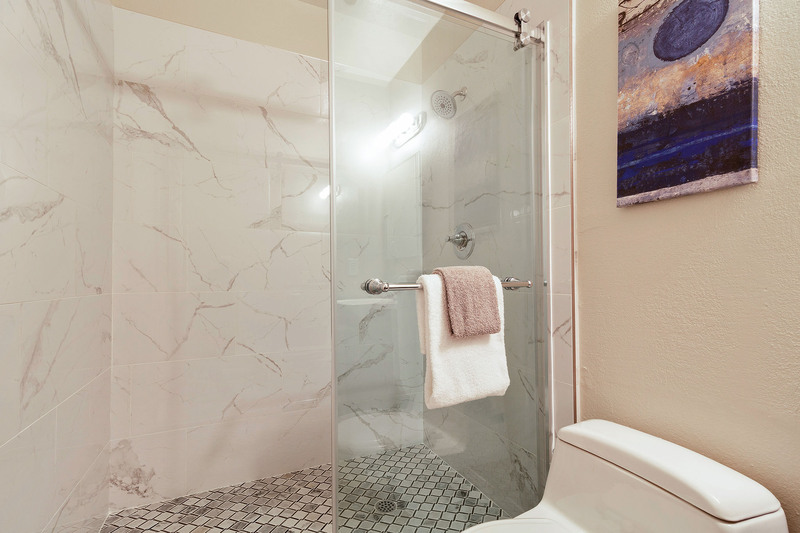 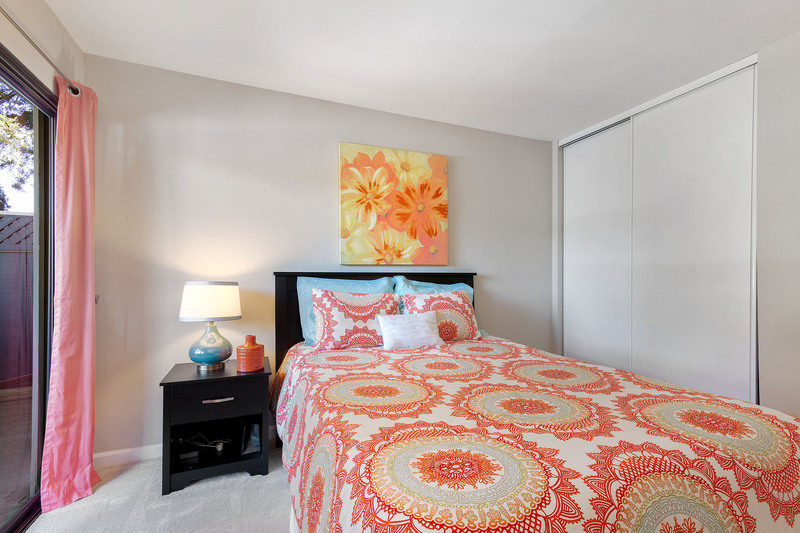 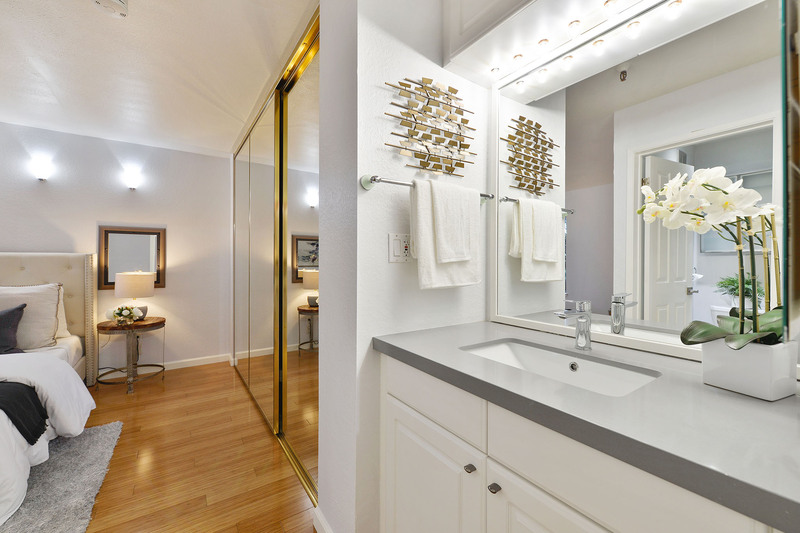 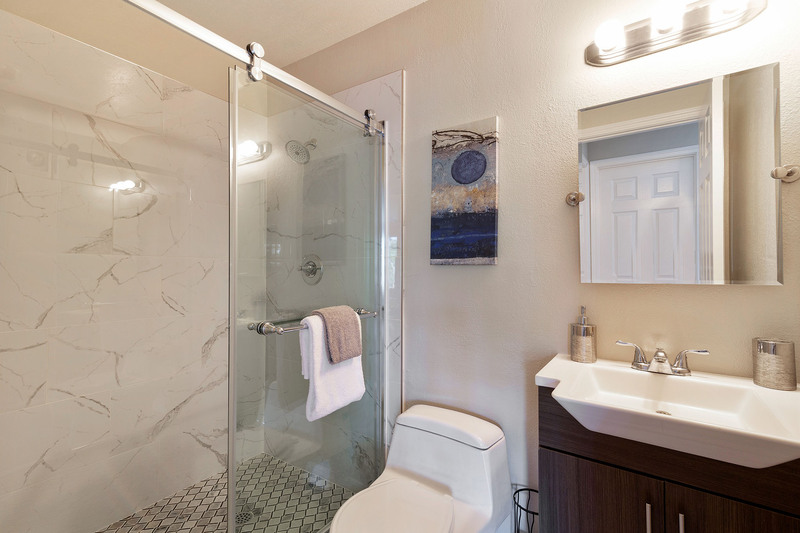 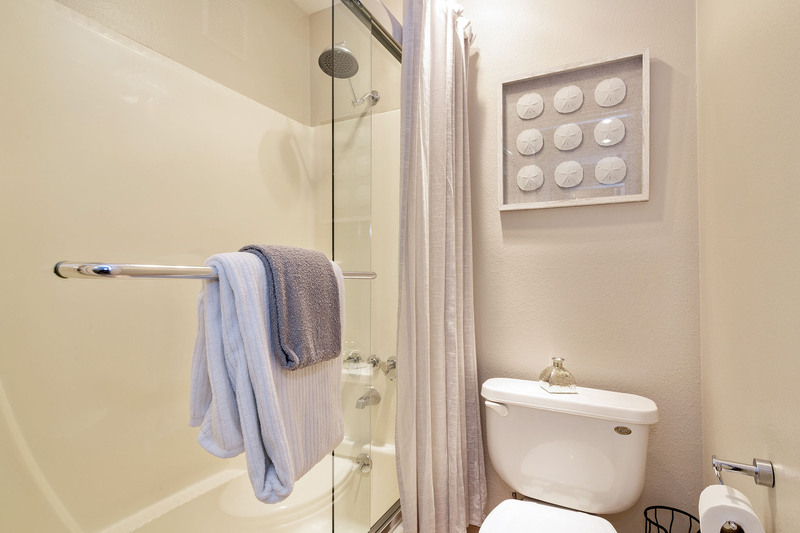 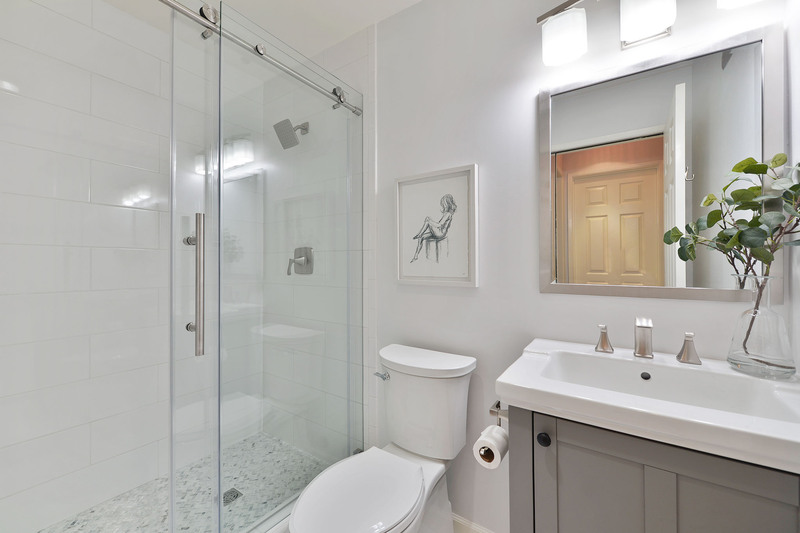 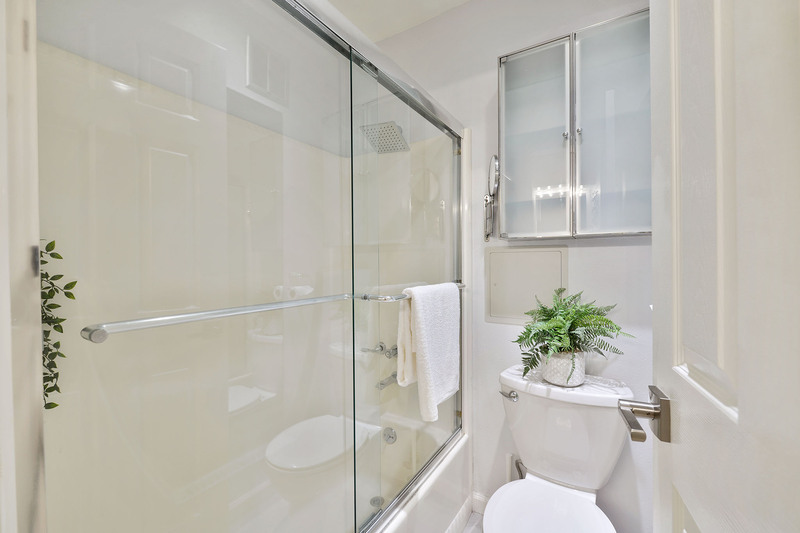 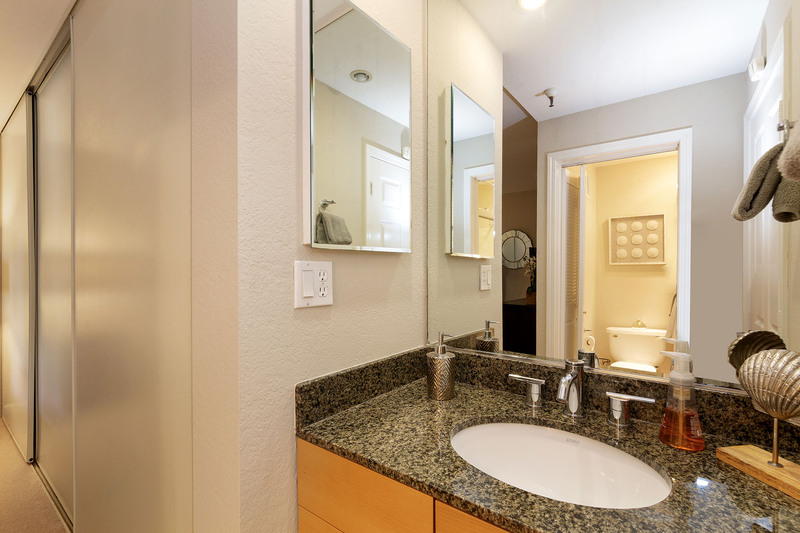 Right out your bedroom door is your remodeled bathroom paired with an added walk-in closet directly across. 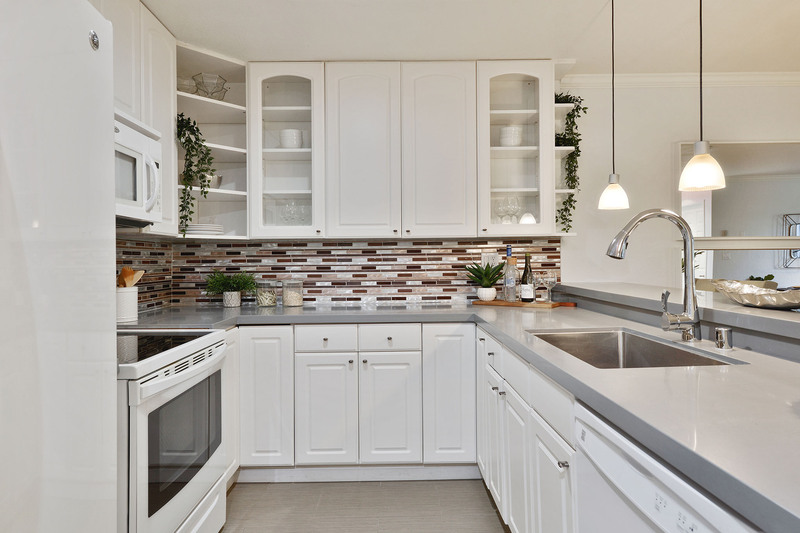 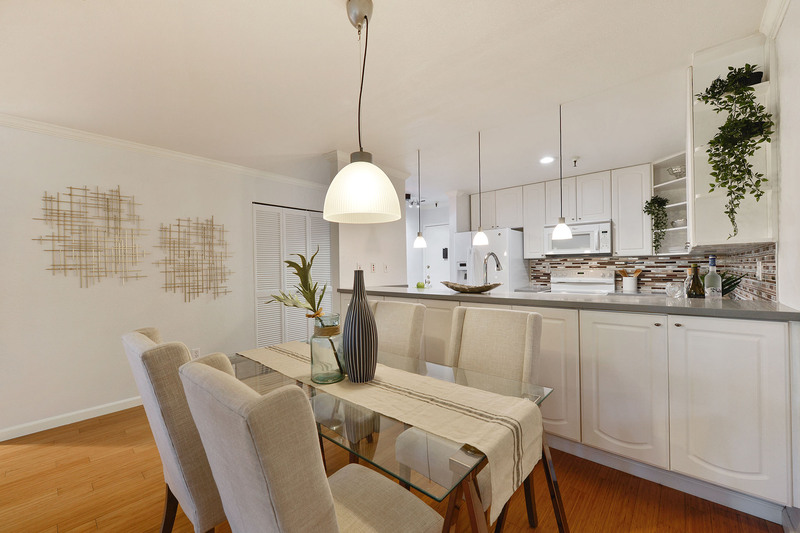 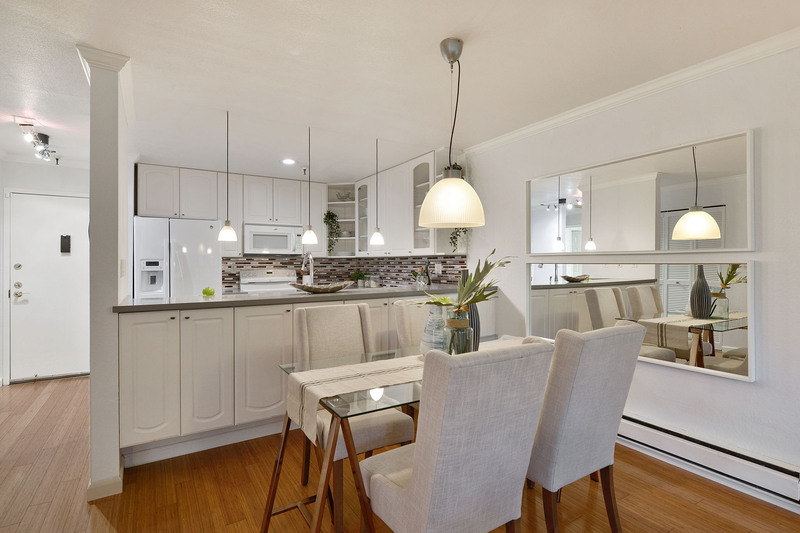 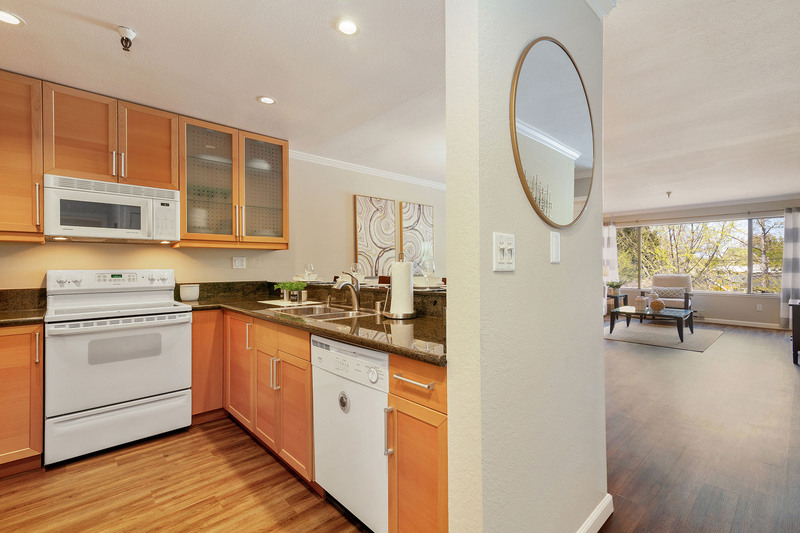 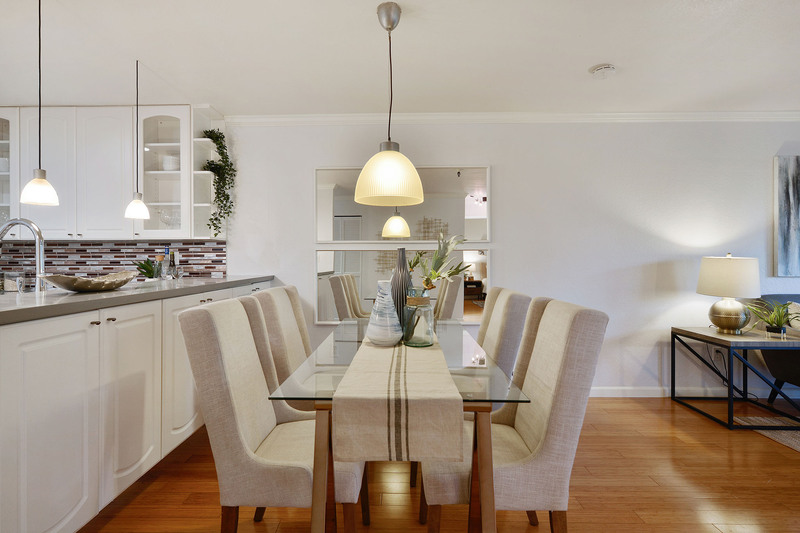 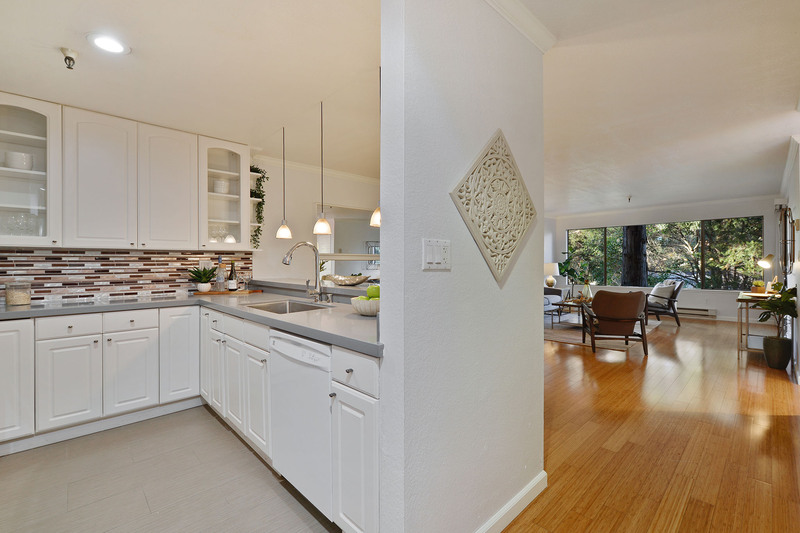 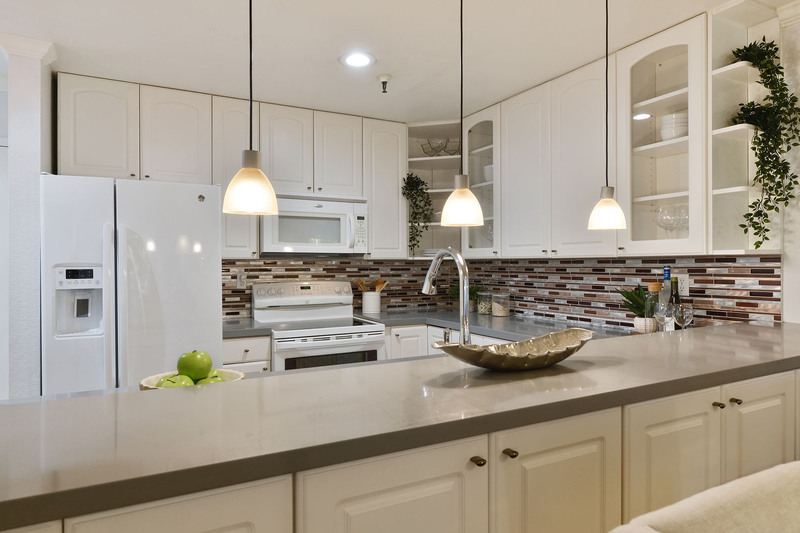 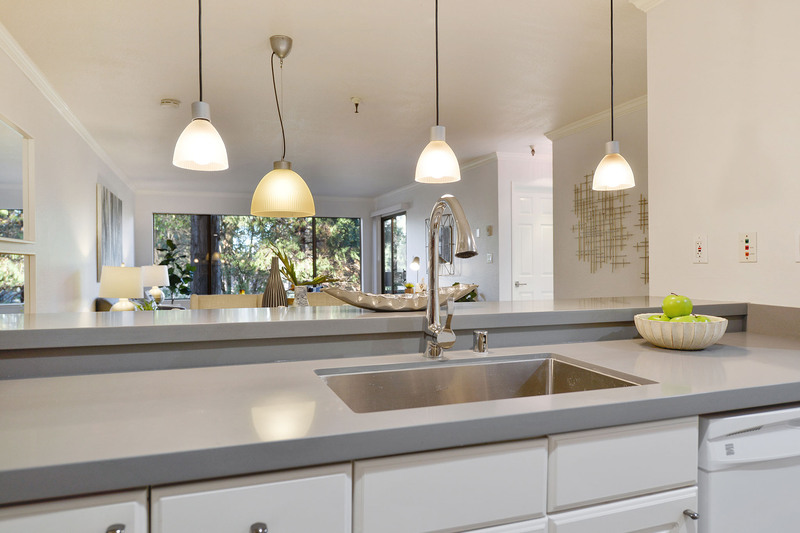 Your remodeled kitchen overlooks your dining room / living room combo. 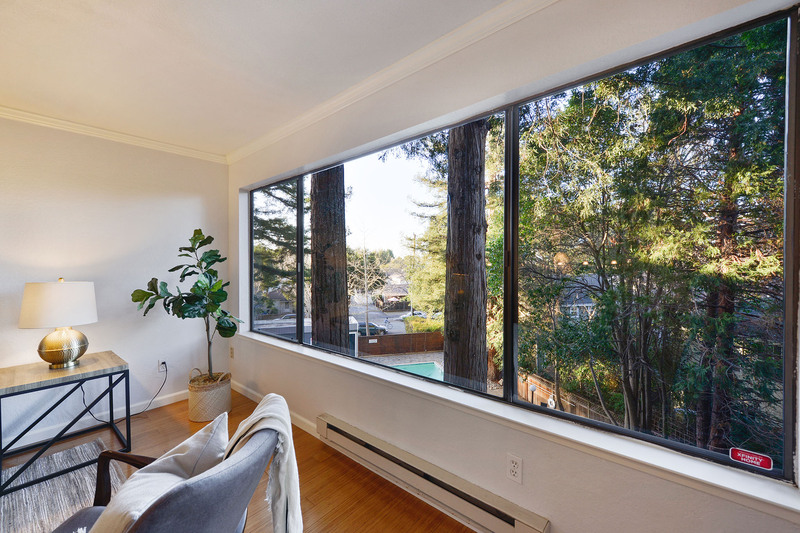 The large window not only allows for an abundance of natural light but allows you to enjoy the picturesque view of the mature Redwoods while you dine and relax in your open concept floorplan. 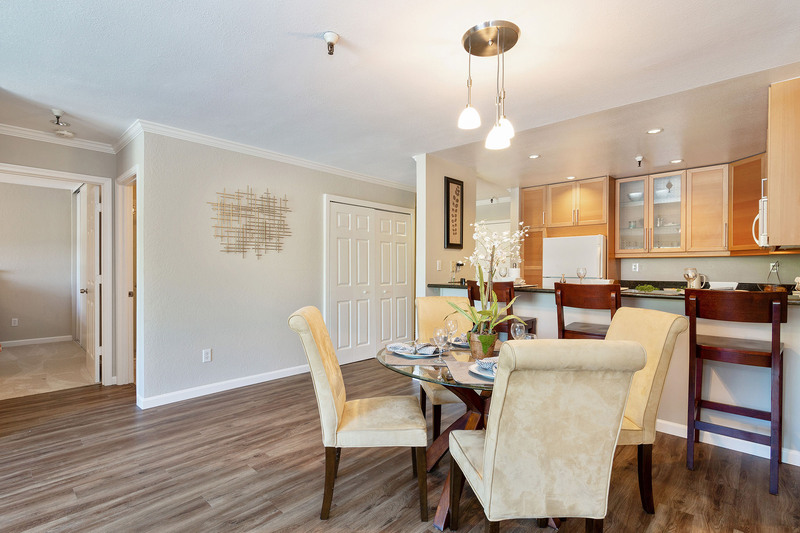 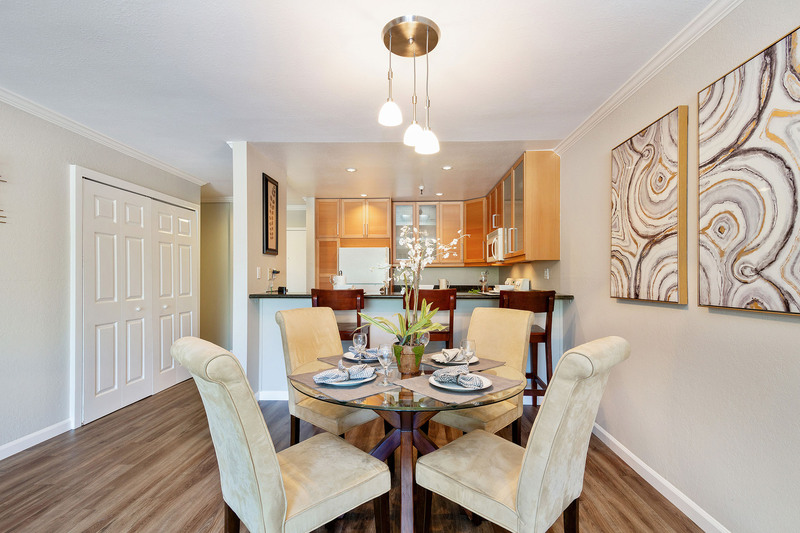 The bamboo flooring throughout ties in this peaceful nature themed condo. 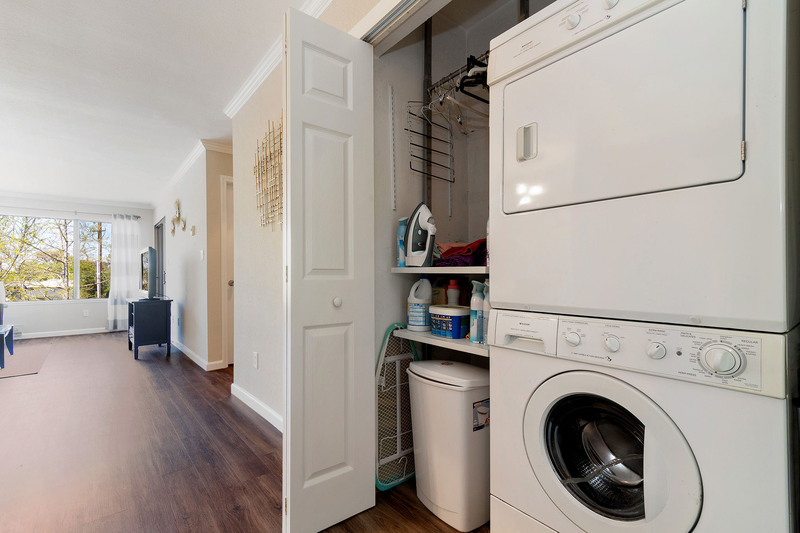 The in-unit washer and dryer bring the comfort to another level. 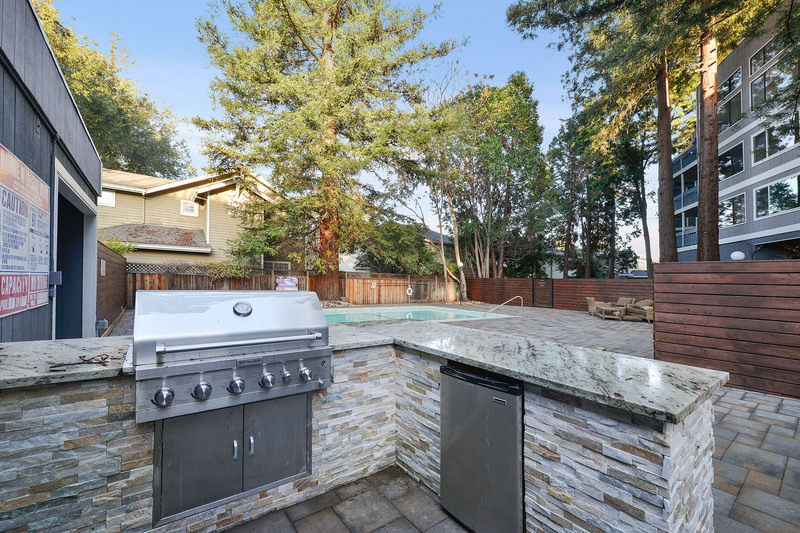 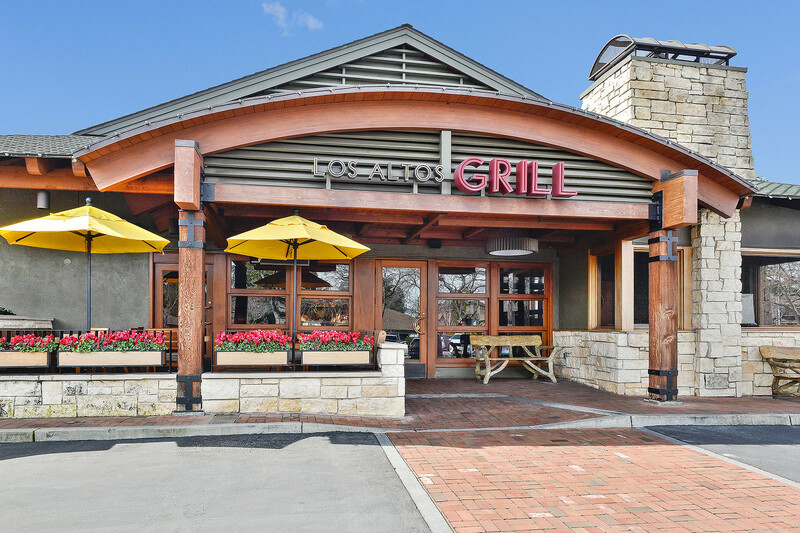 Enjoy your time relaxing by the pool and sauna all while cooking on the outdoor grill. 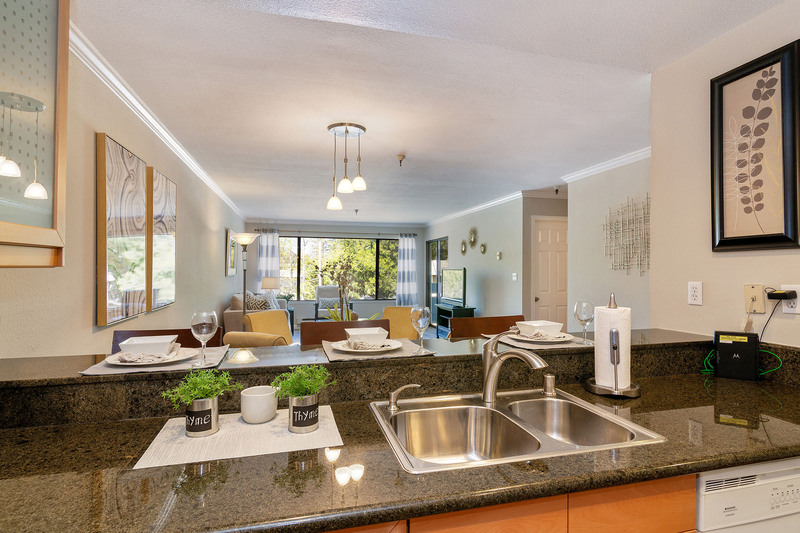 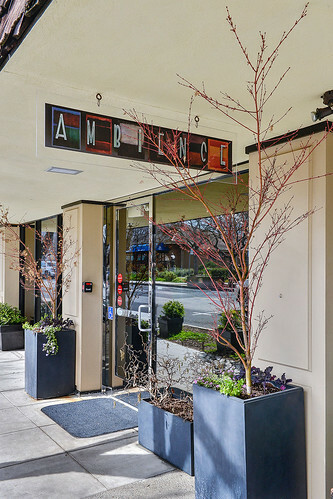 This centrally located condo is surrounded by everything you need. 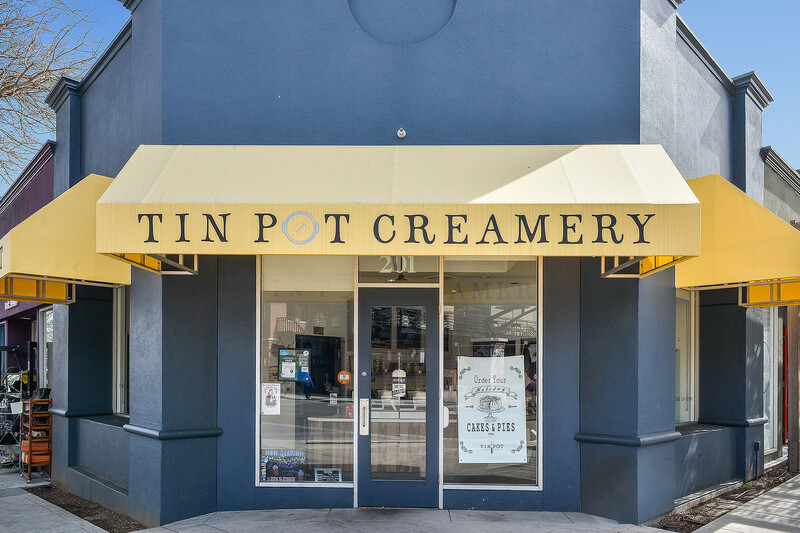 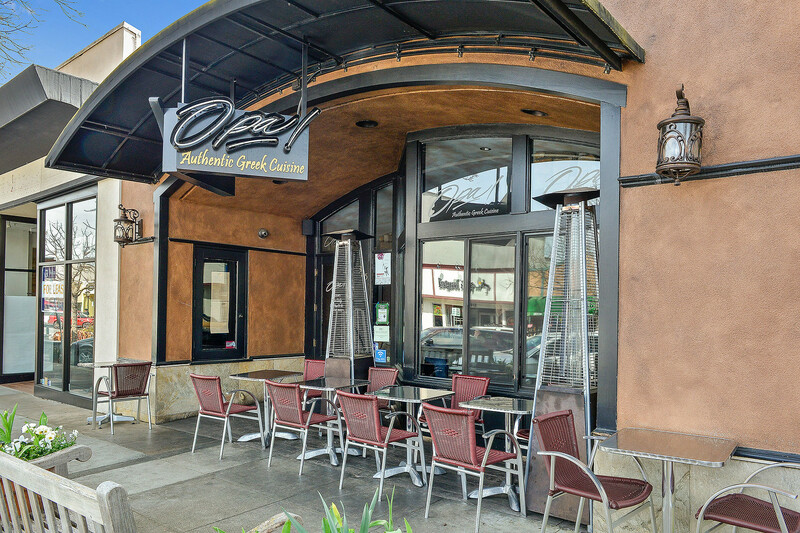 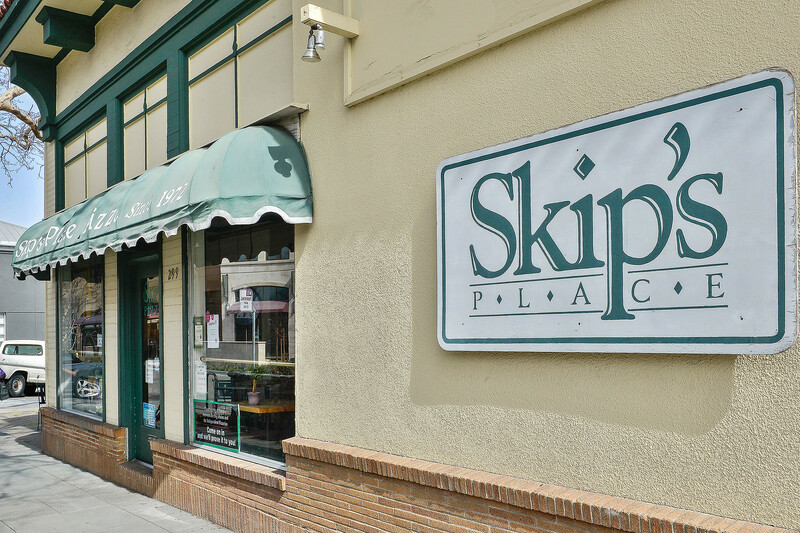 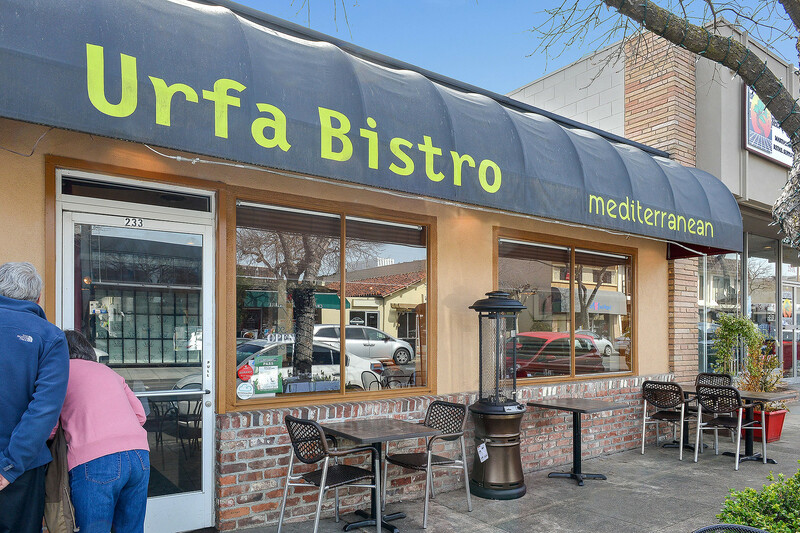 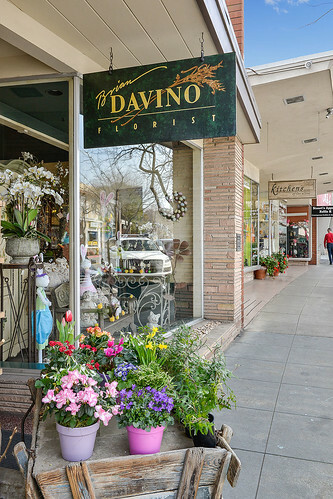 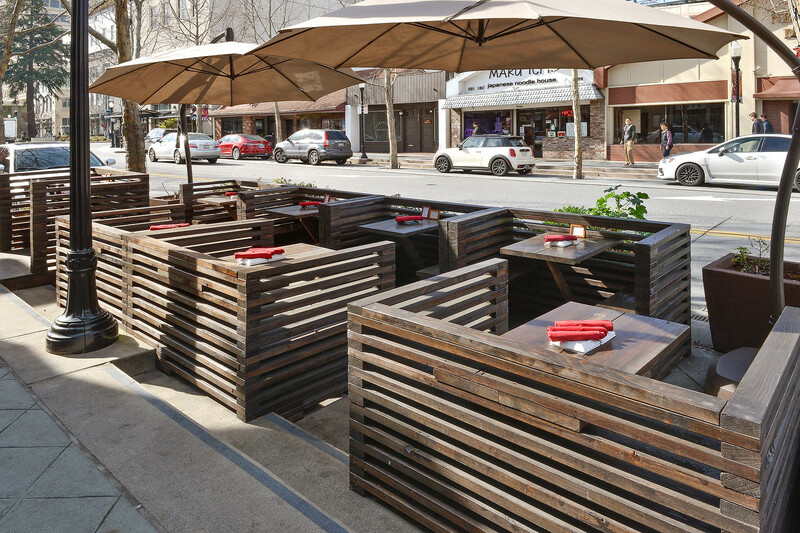 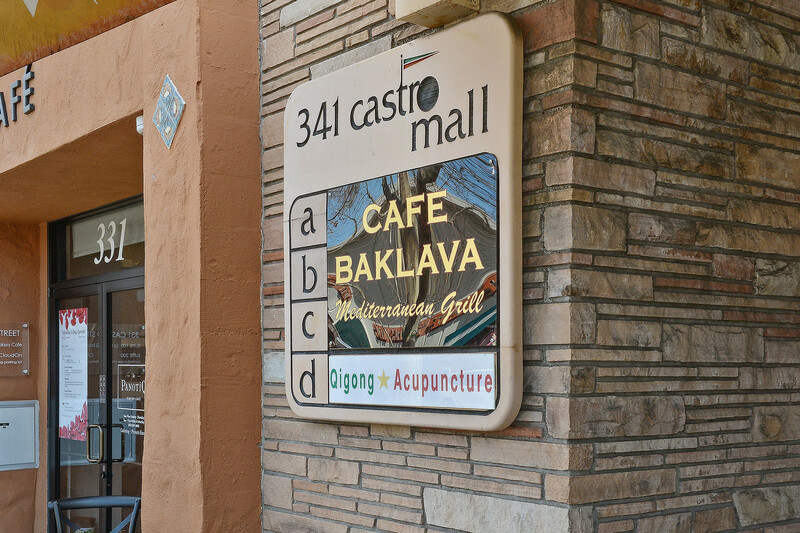 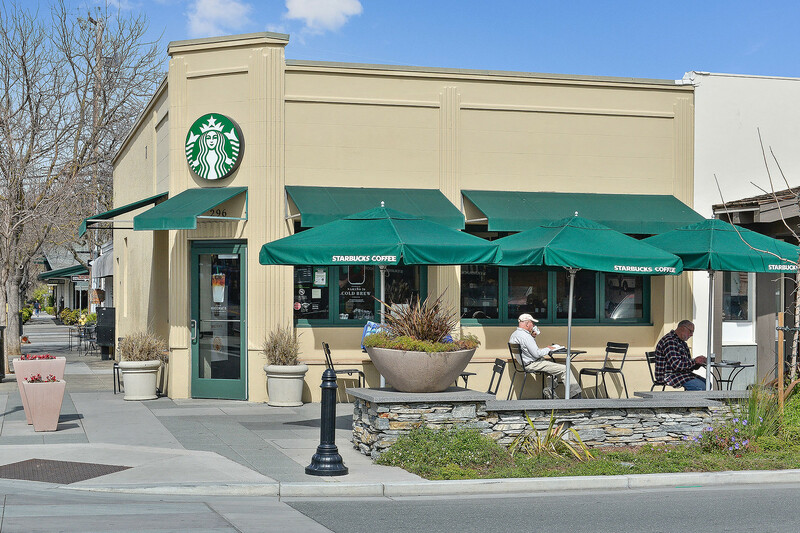 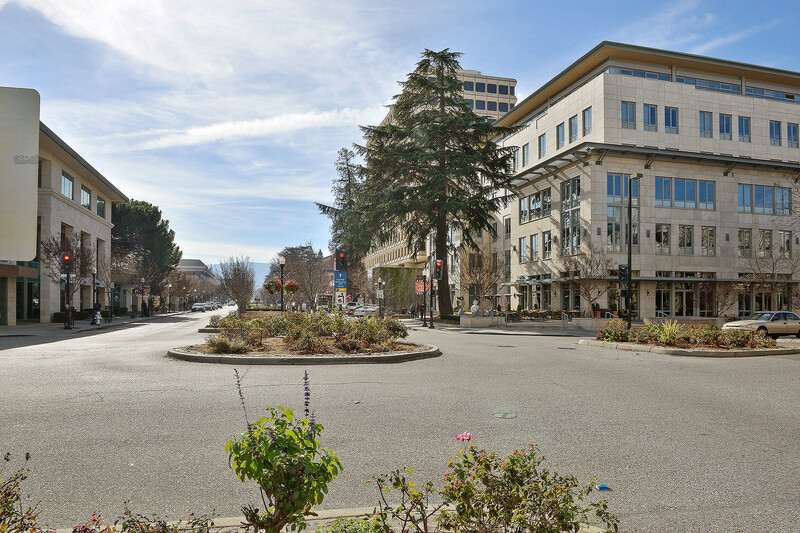 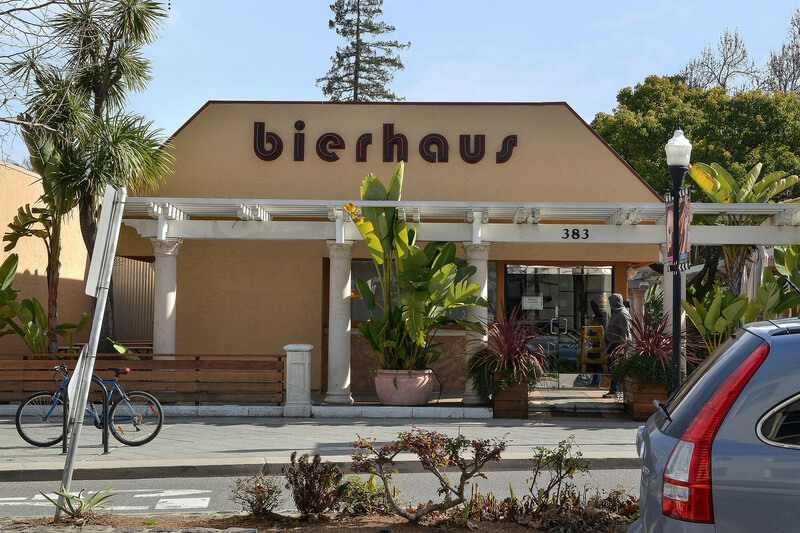 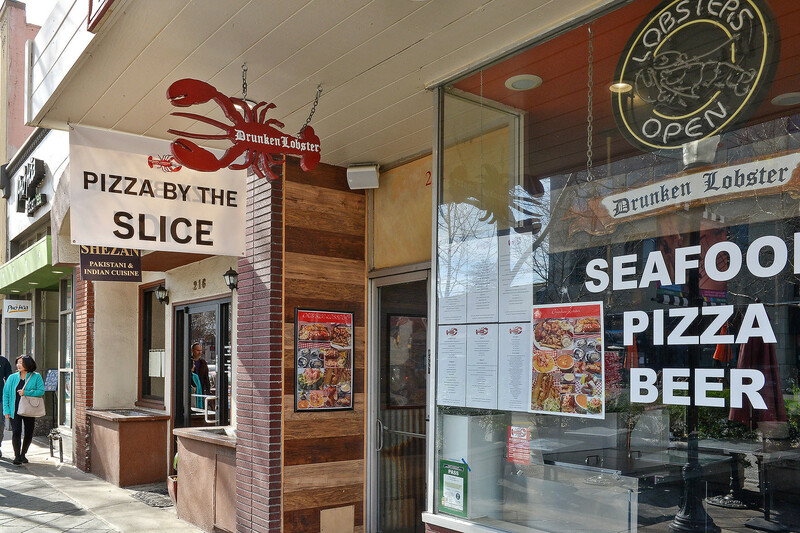 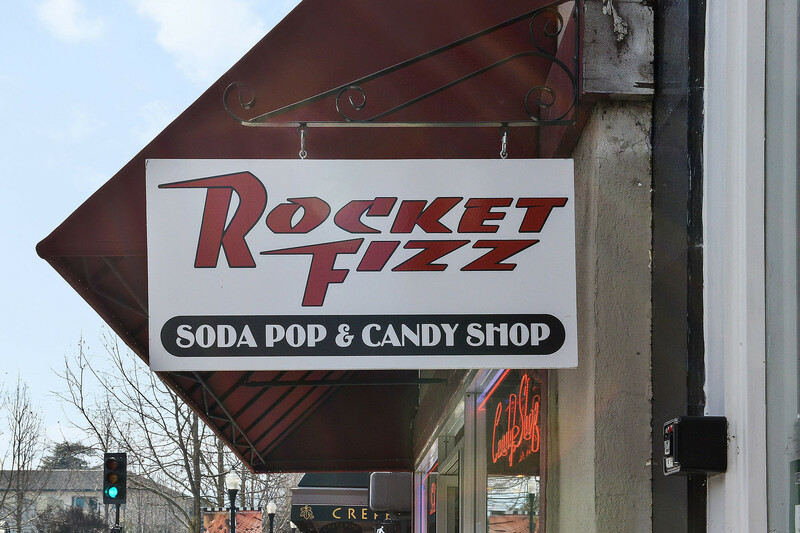 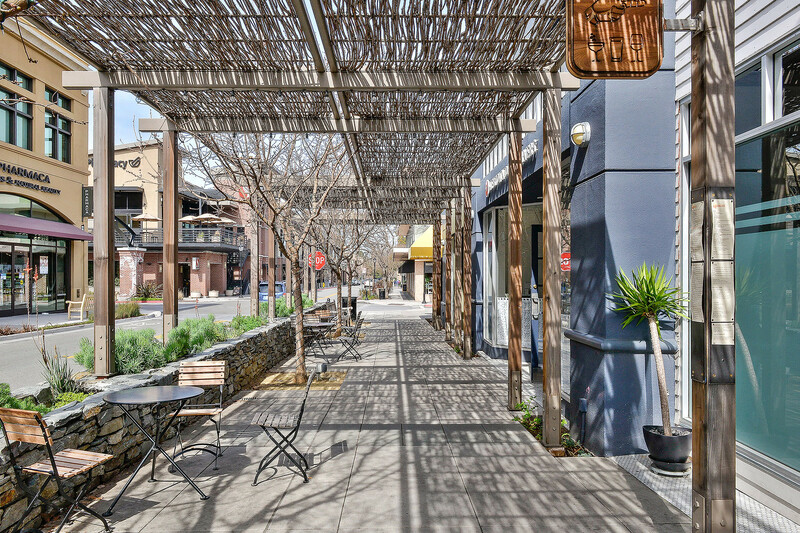 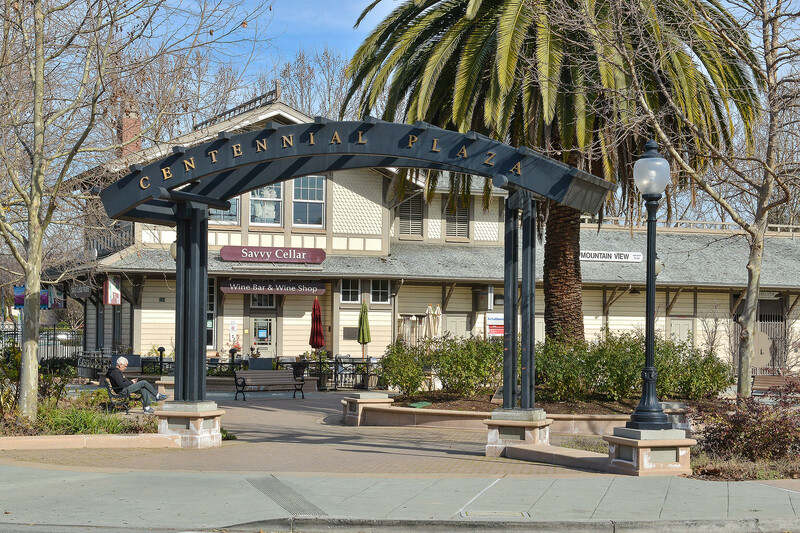 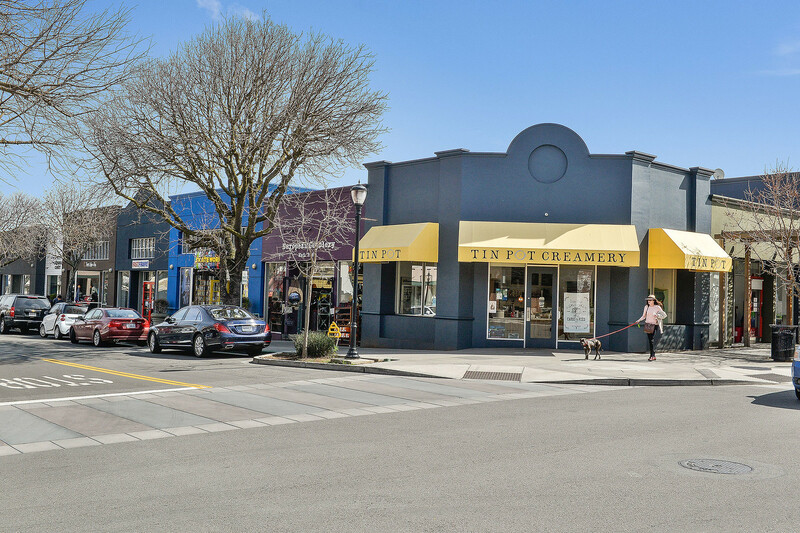 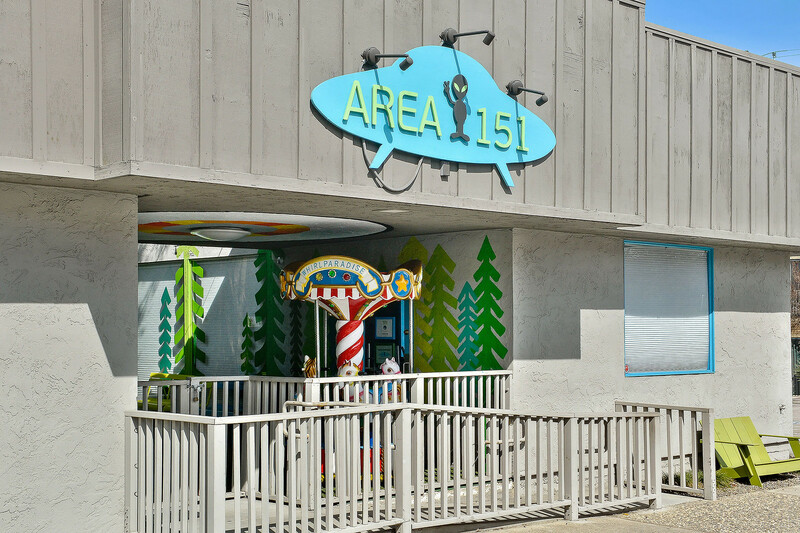 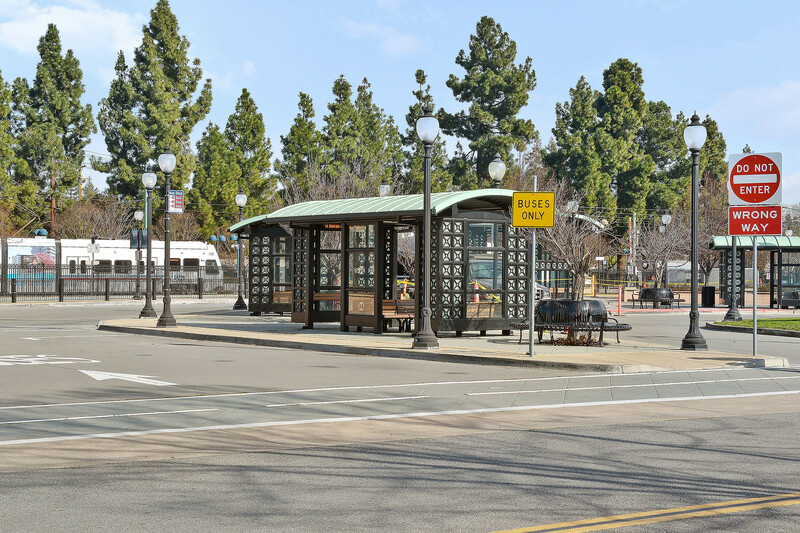 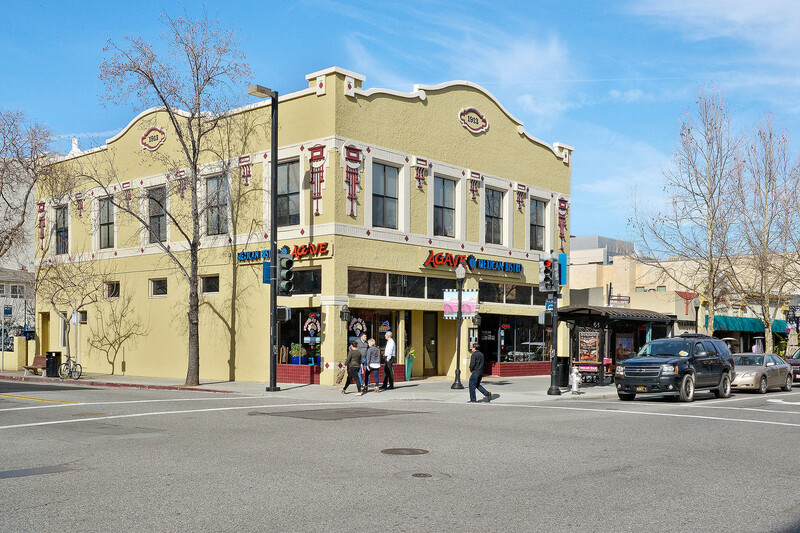 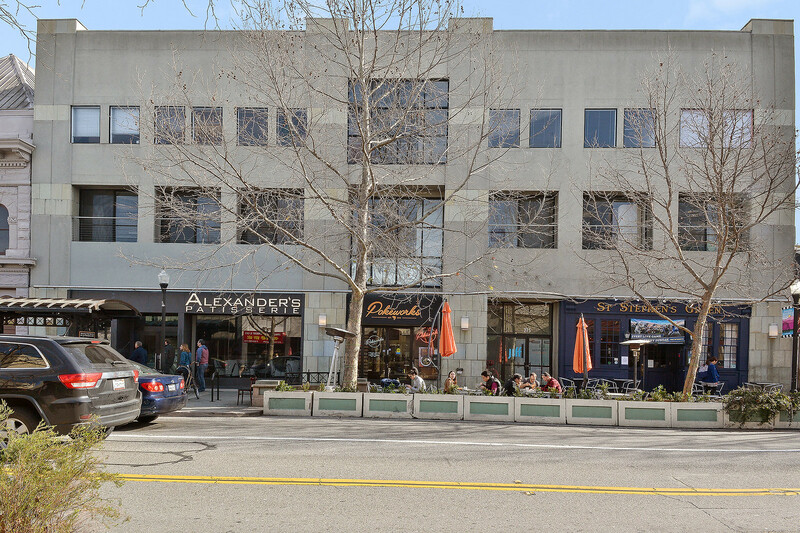 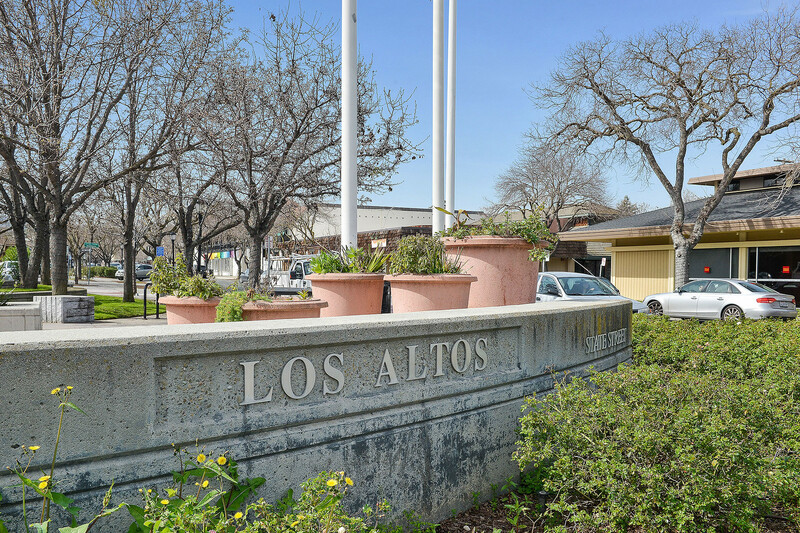 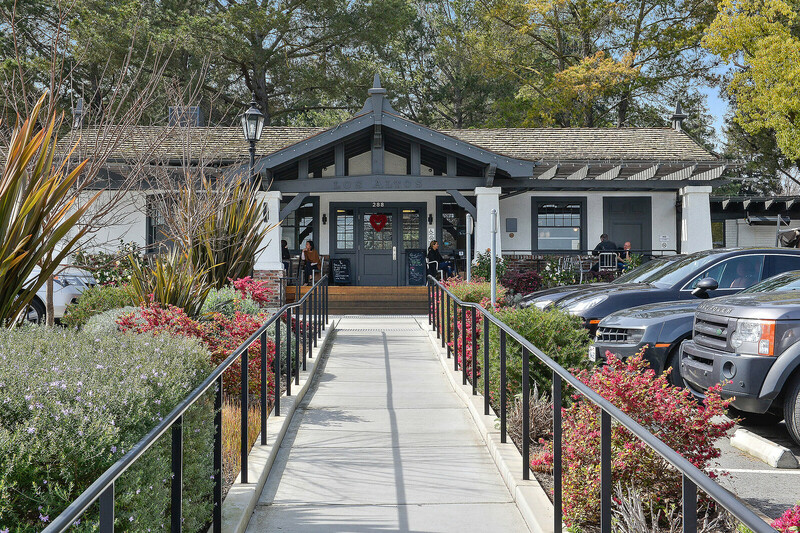 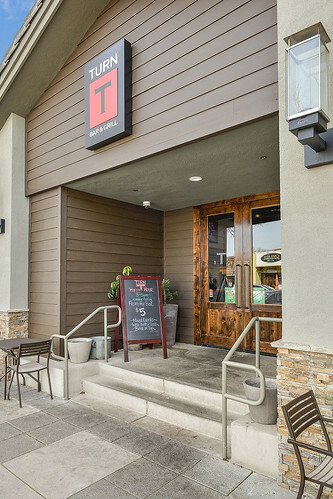 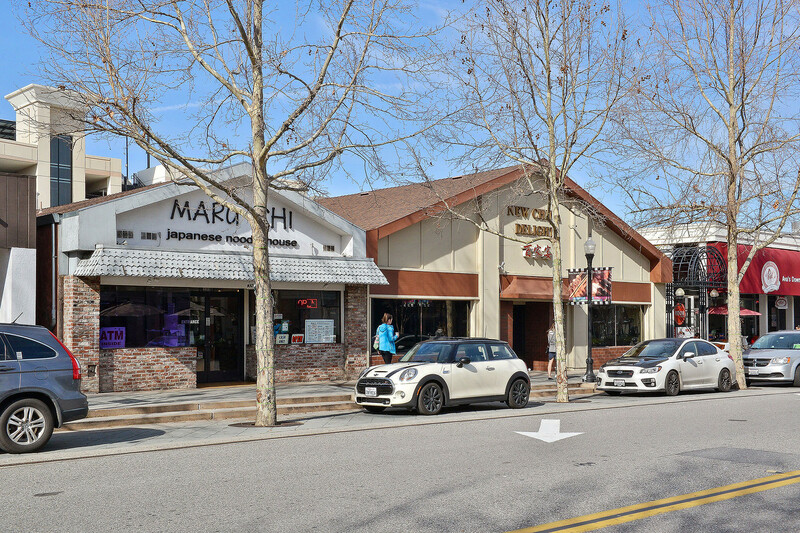 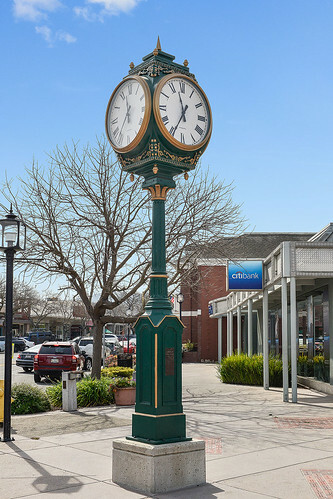 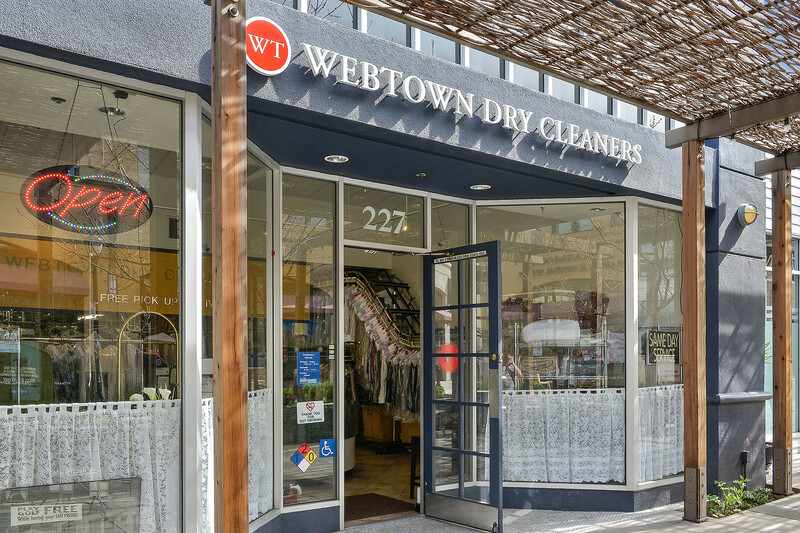 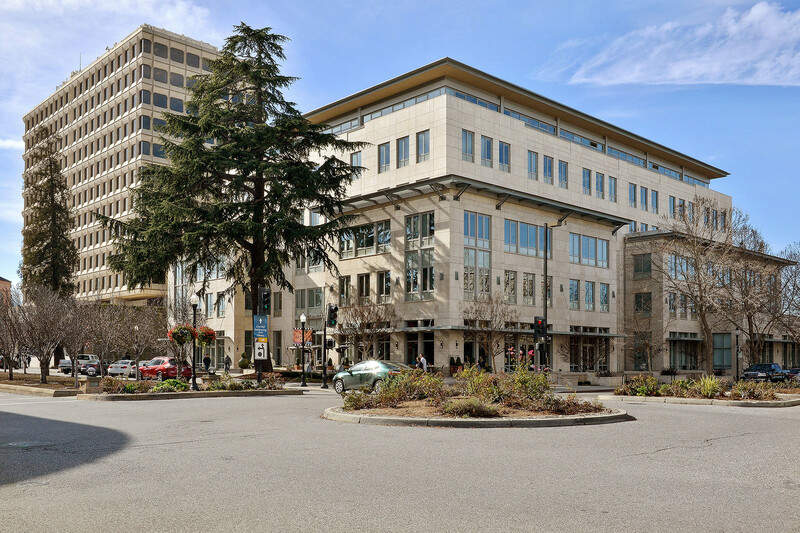 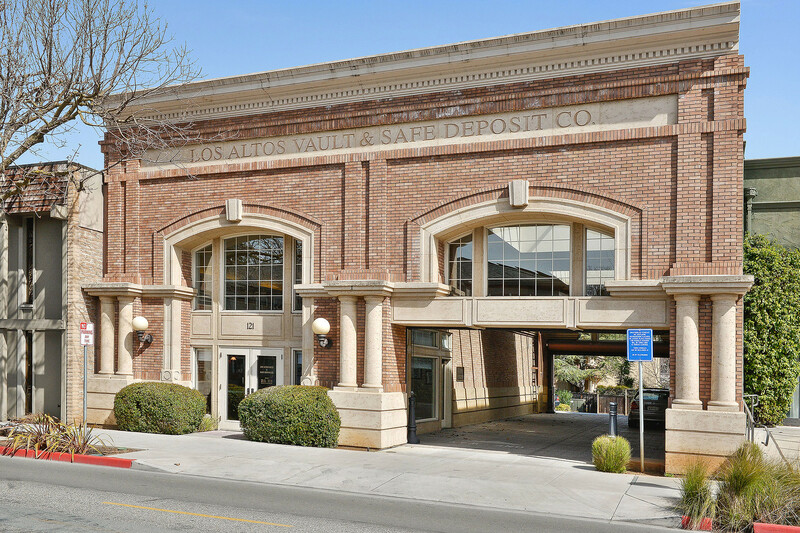 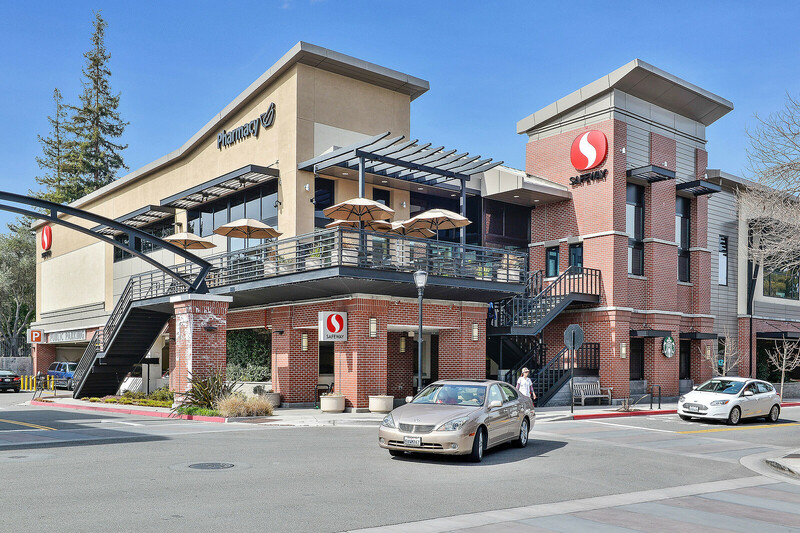 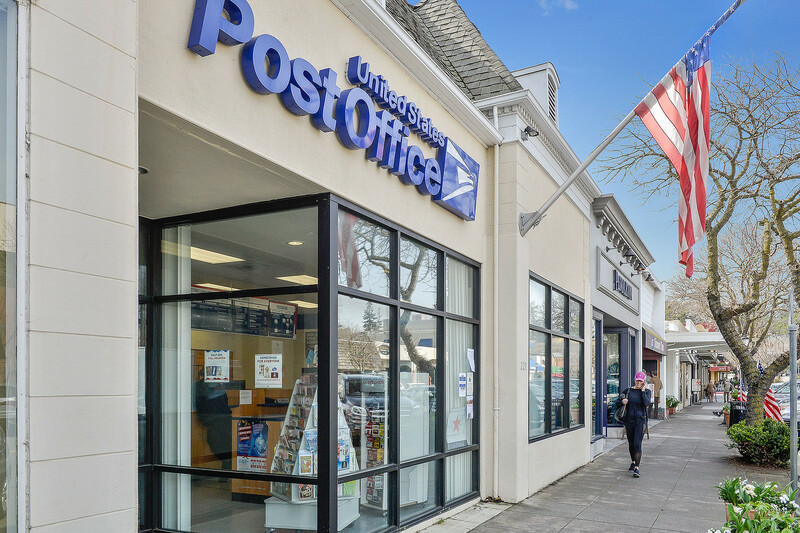 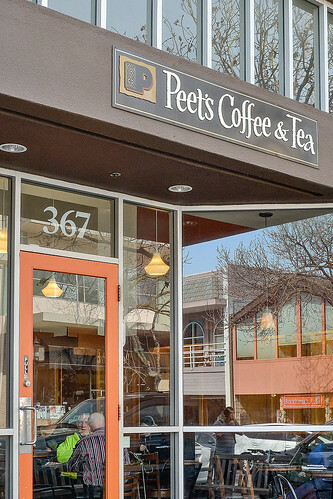 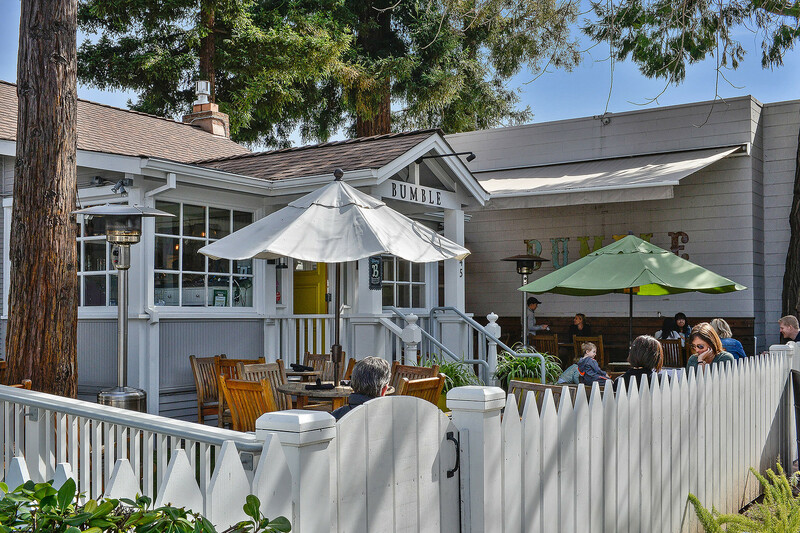 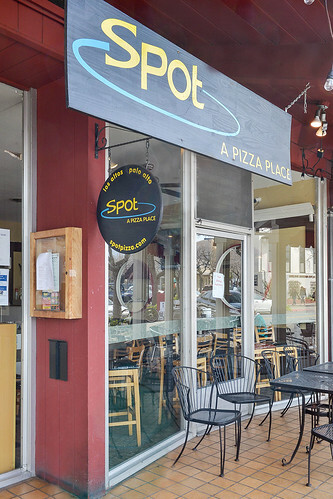 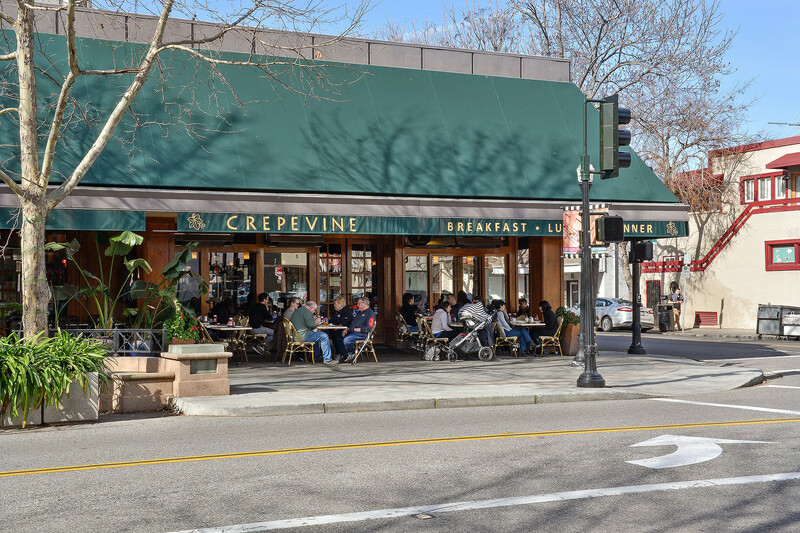 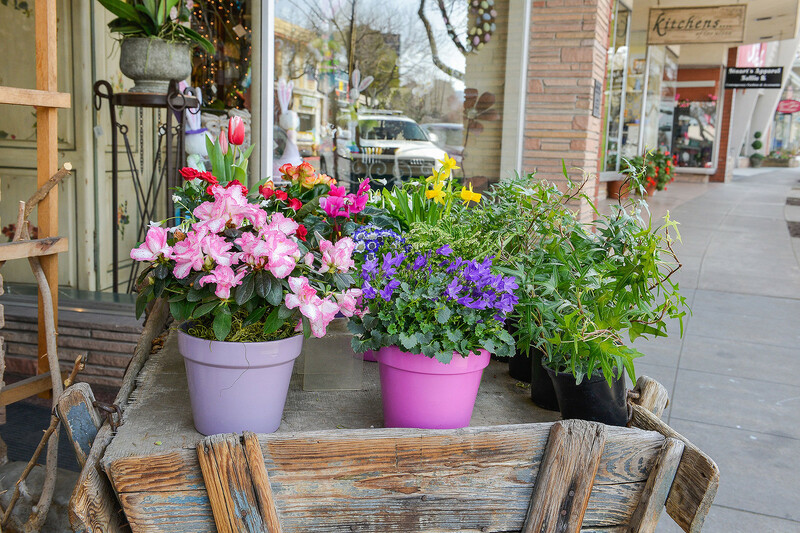 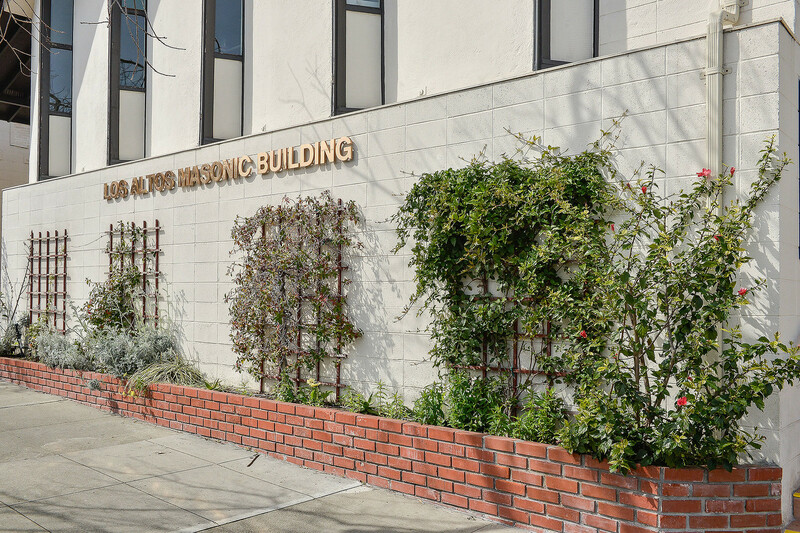 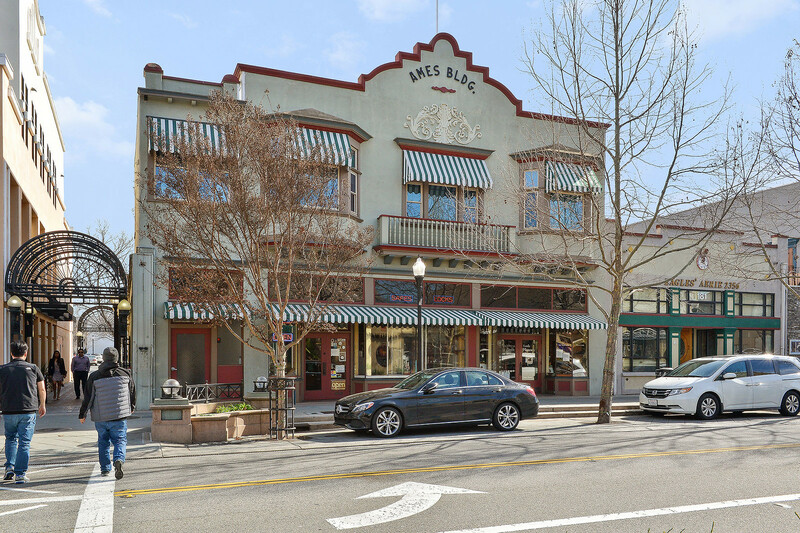 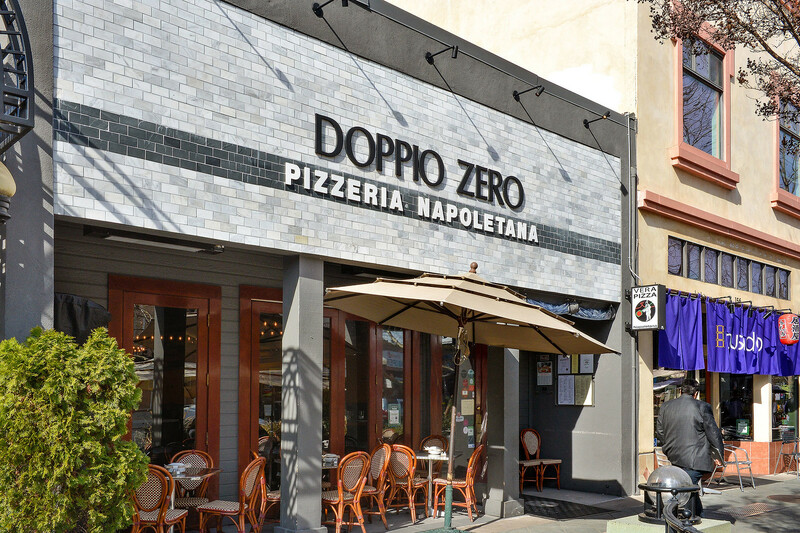 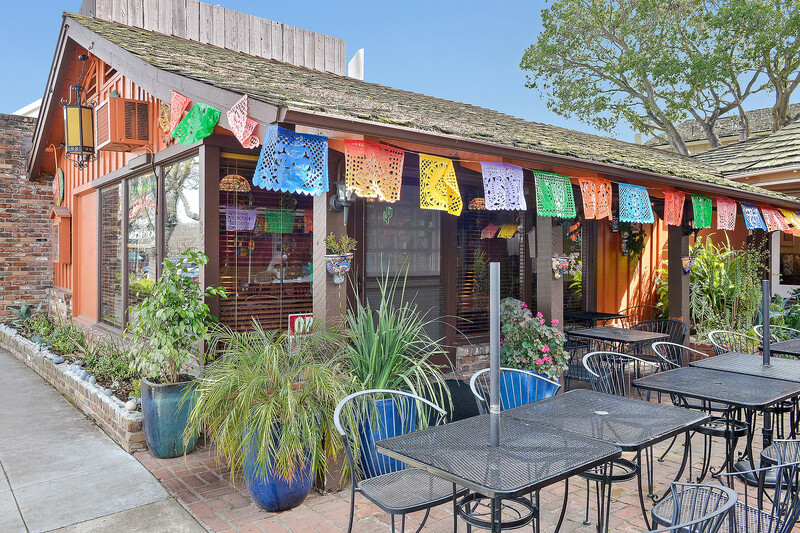 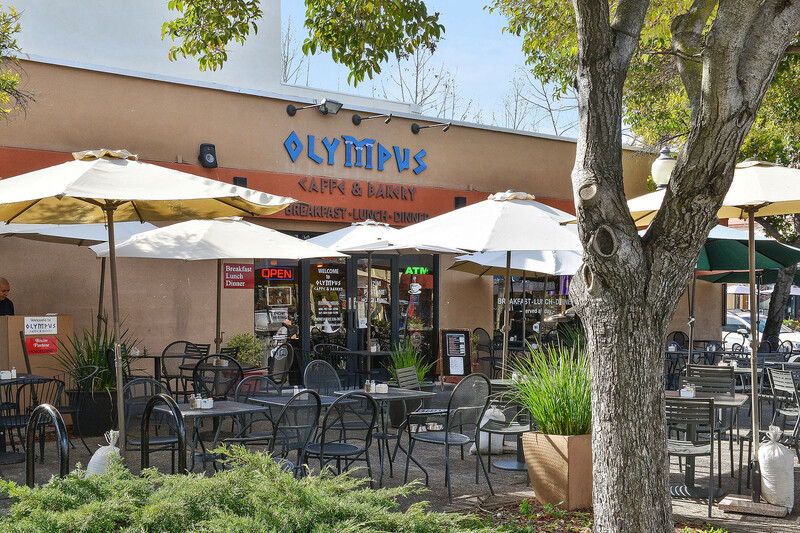 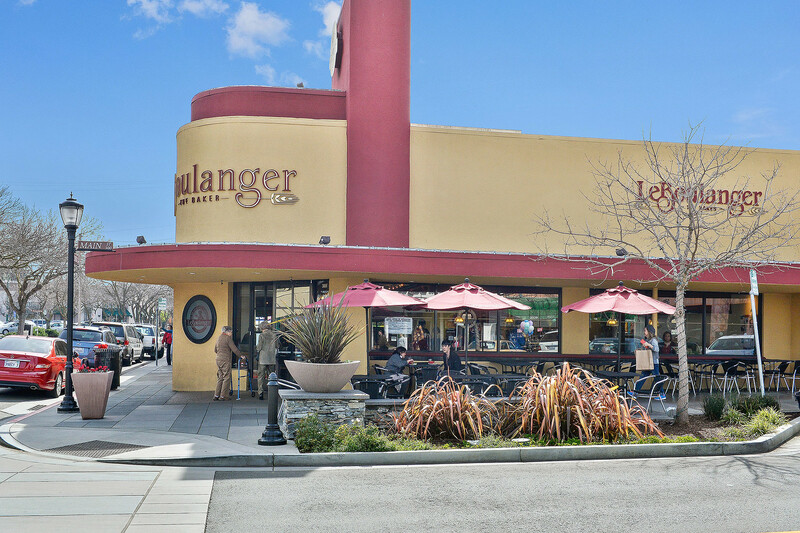 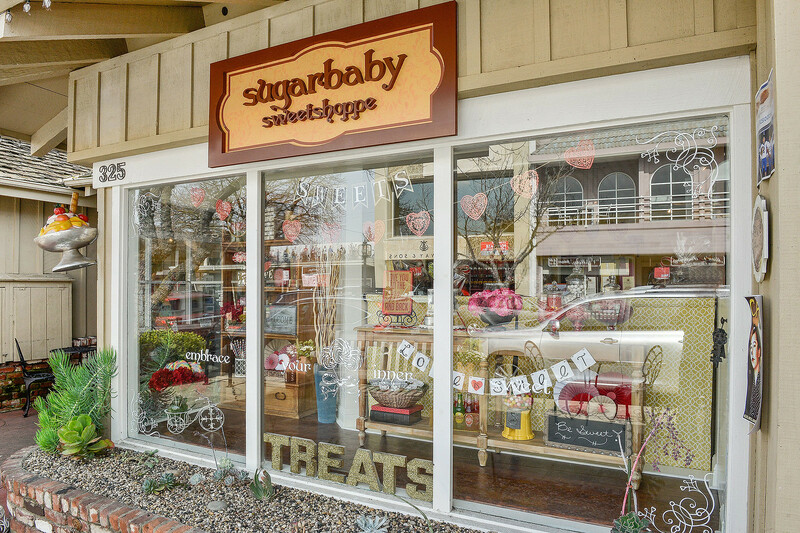 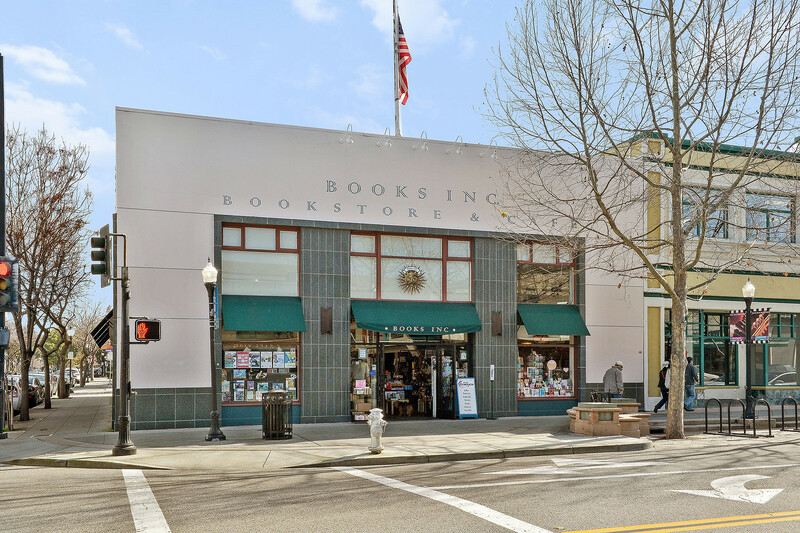 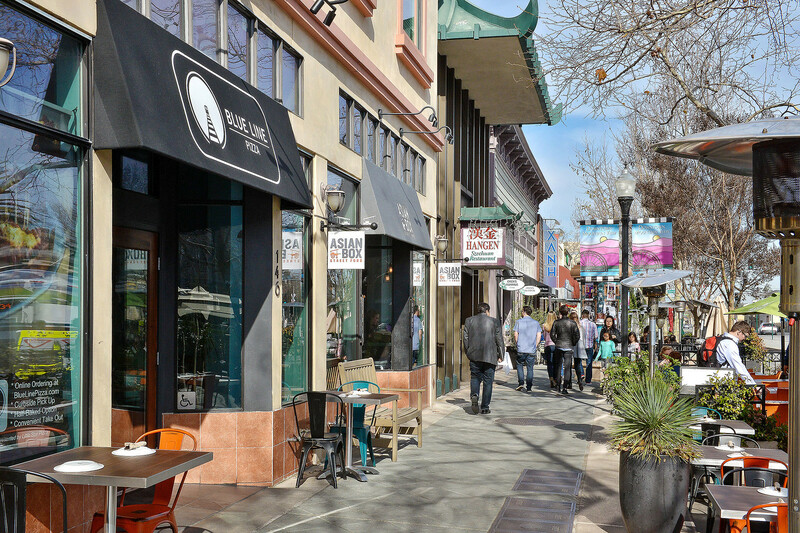 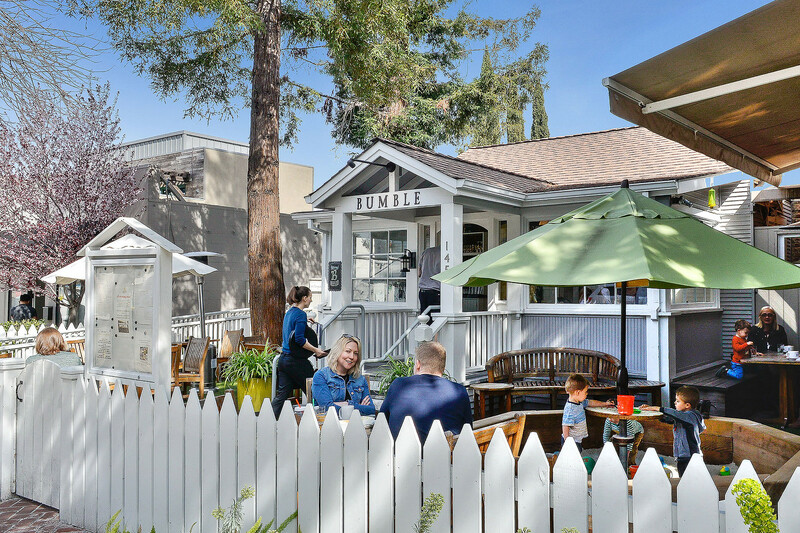 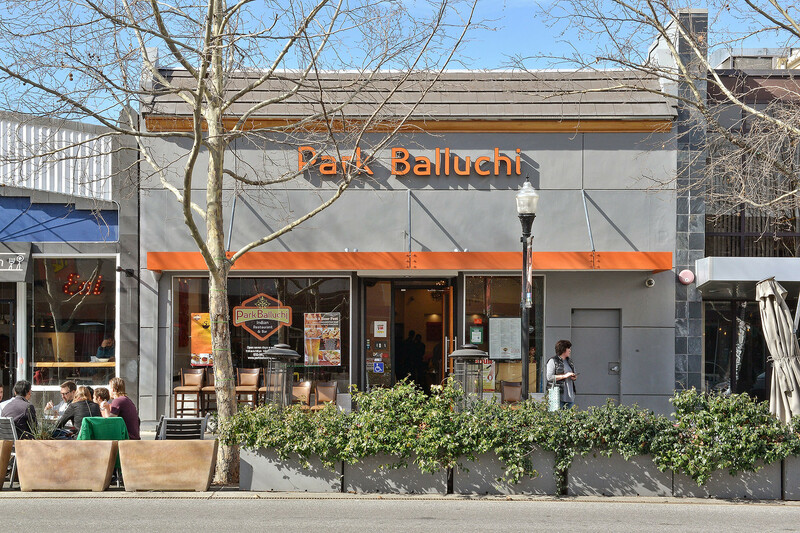 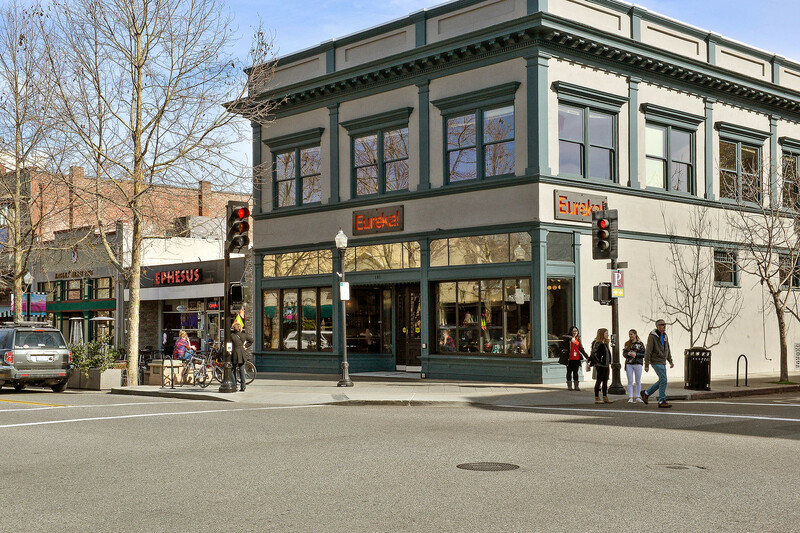 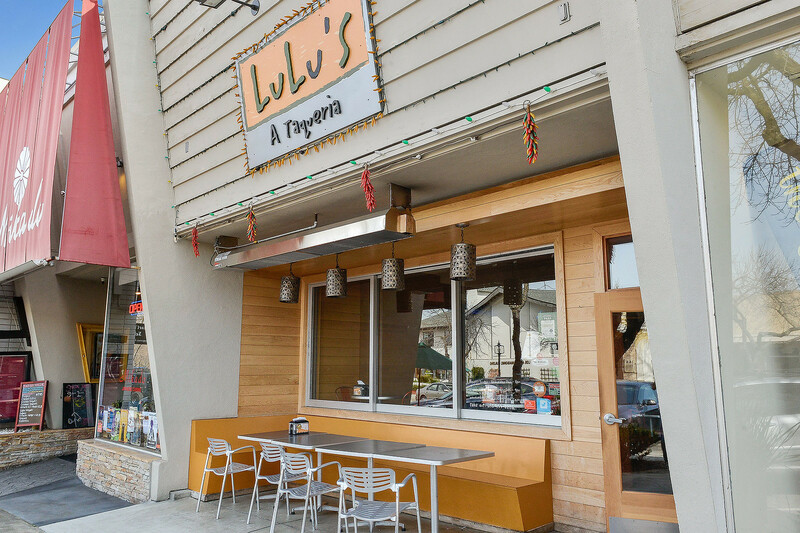 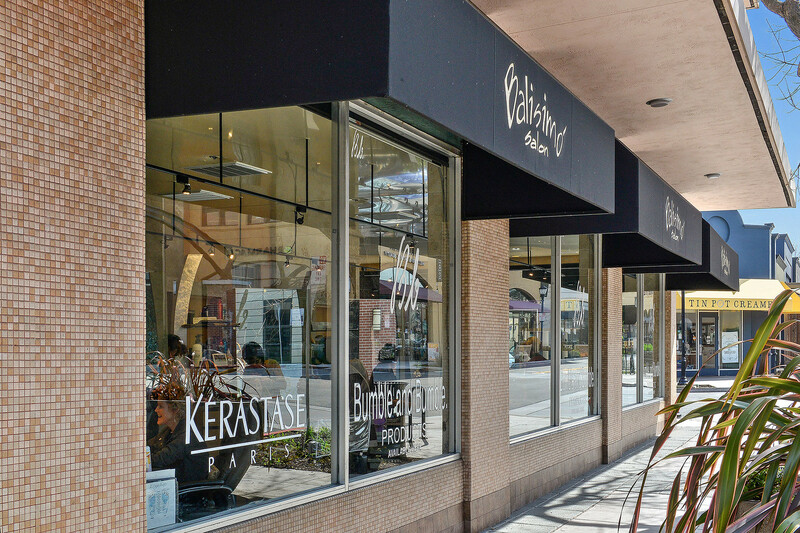 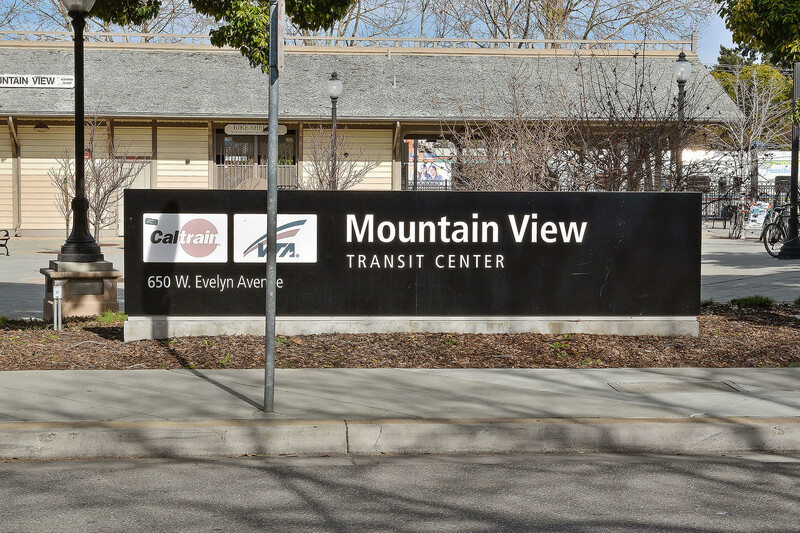 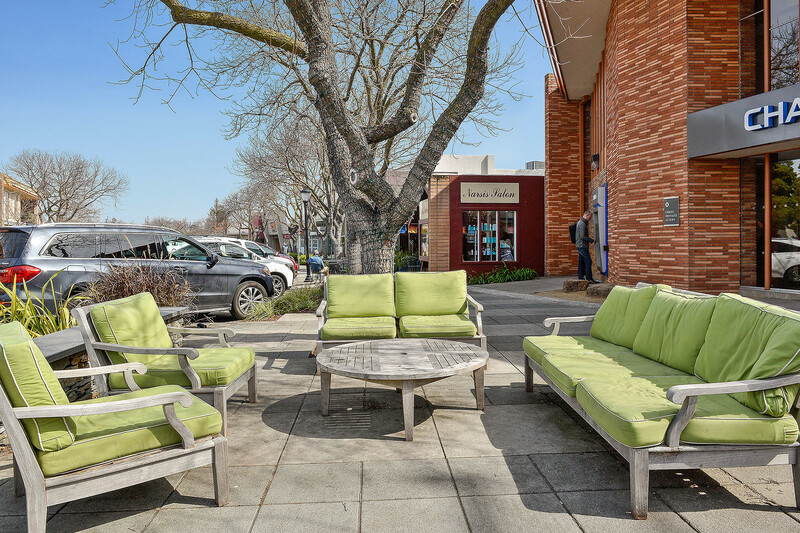 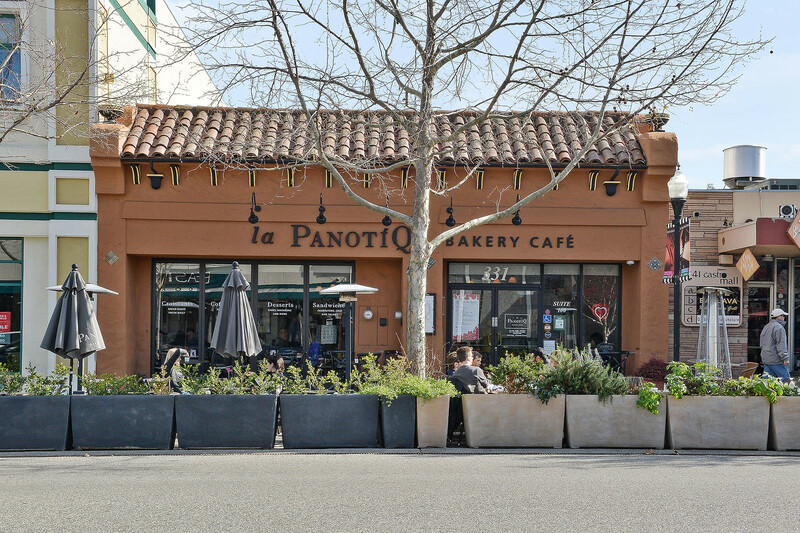 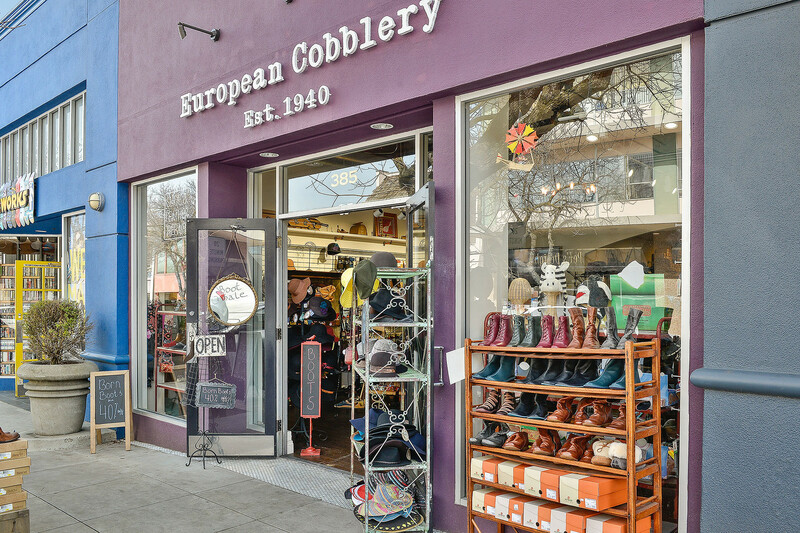 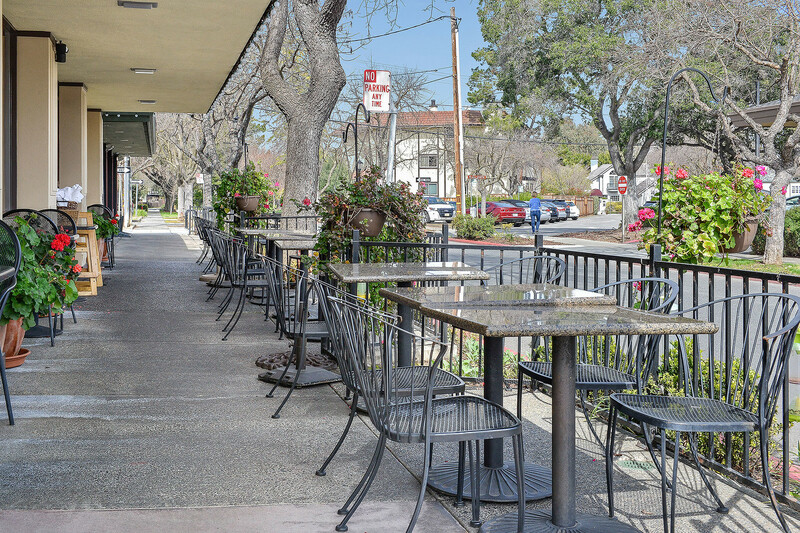 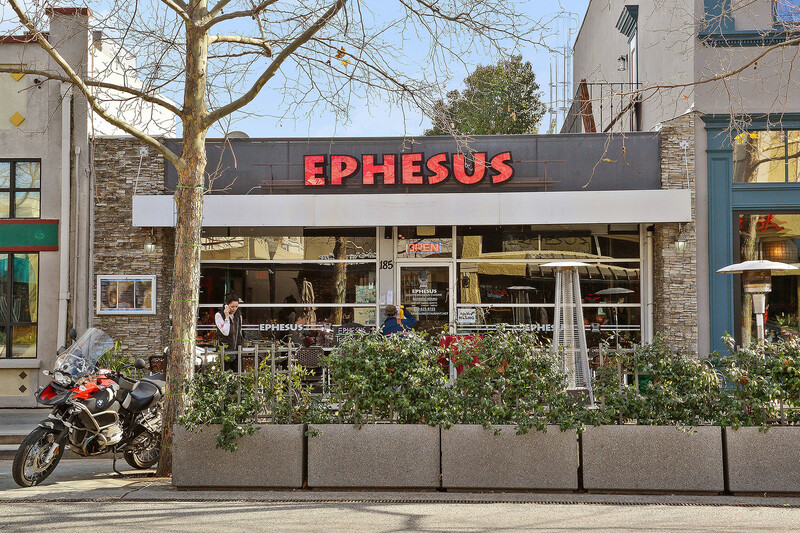 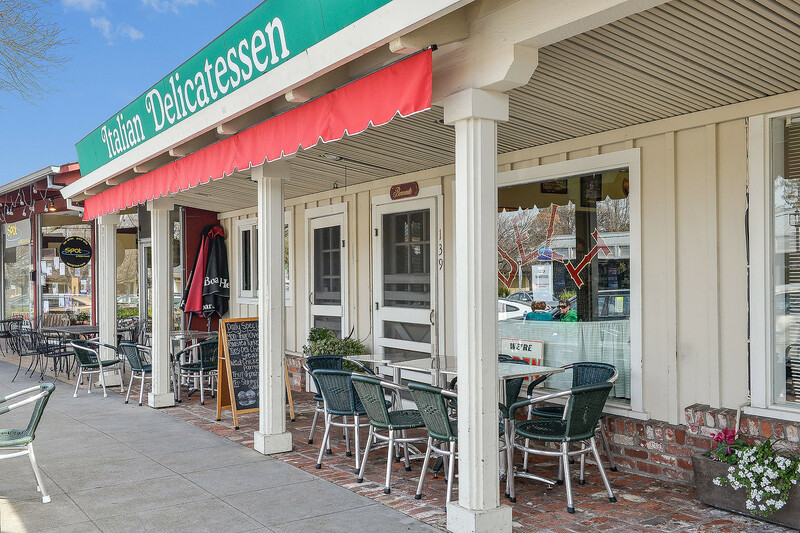 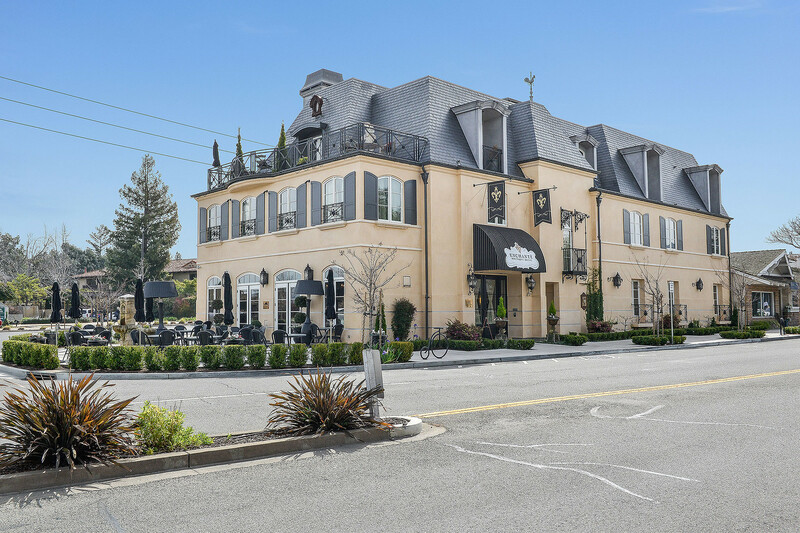 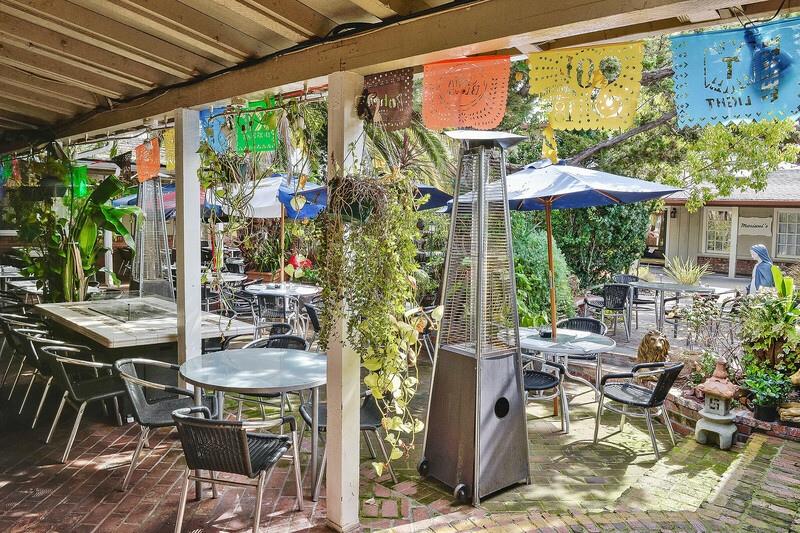 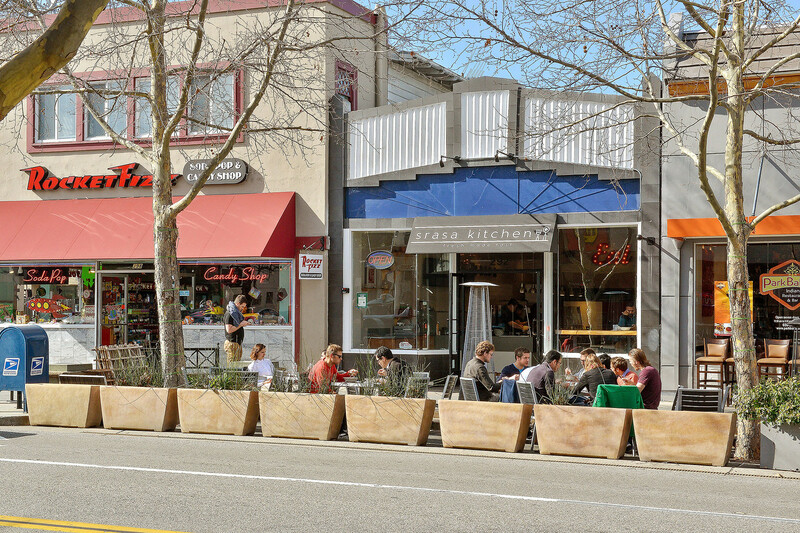 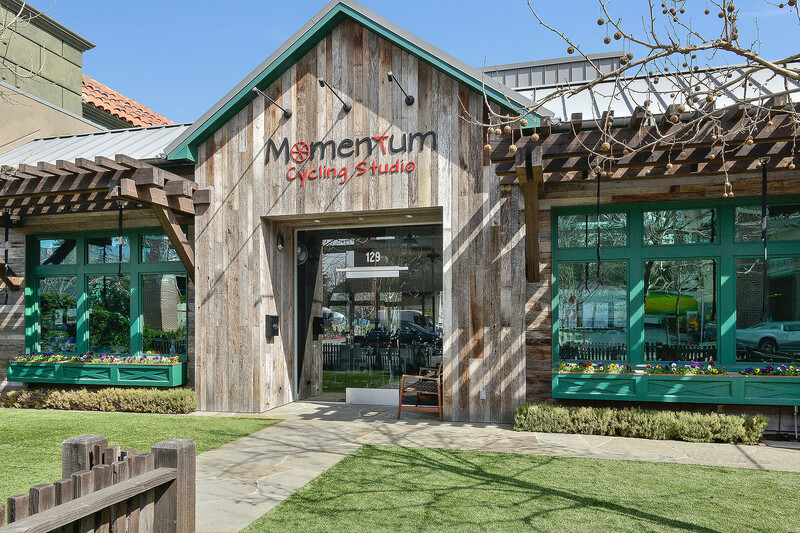 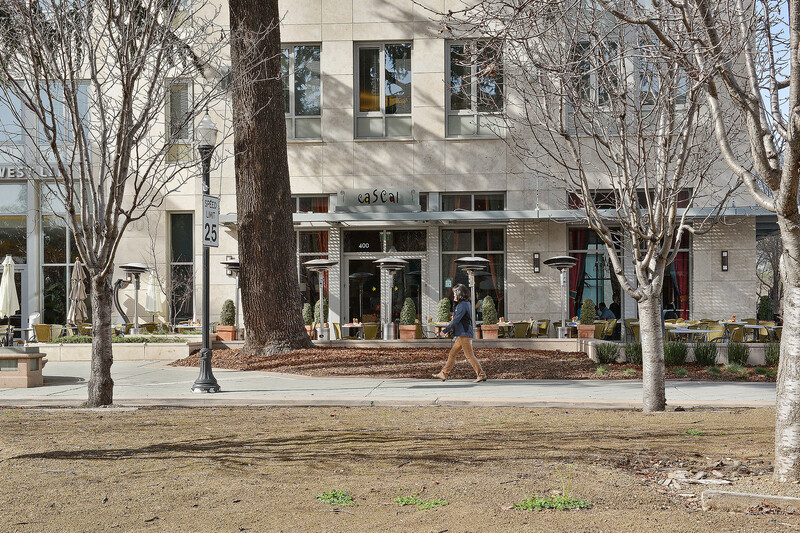 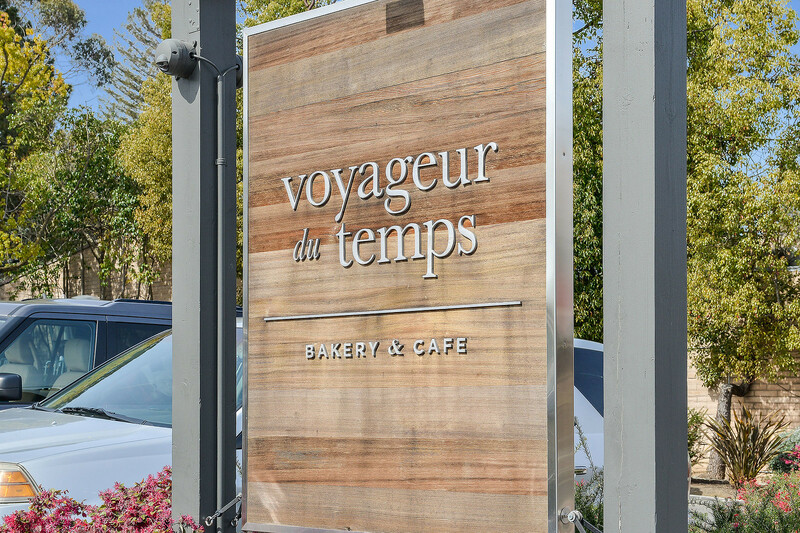 Downtown Mountain View is just a few blocks away offering shops, dining, entertainment and regularly scheduled events. 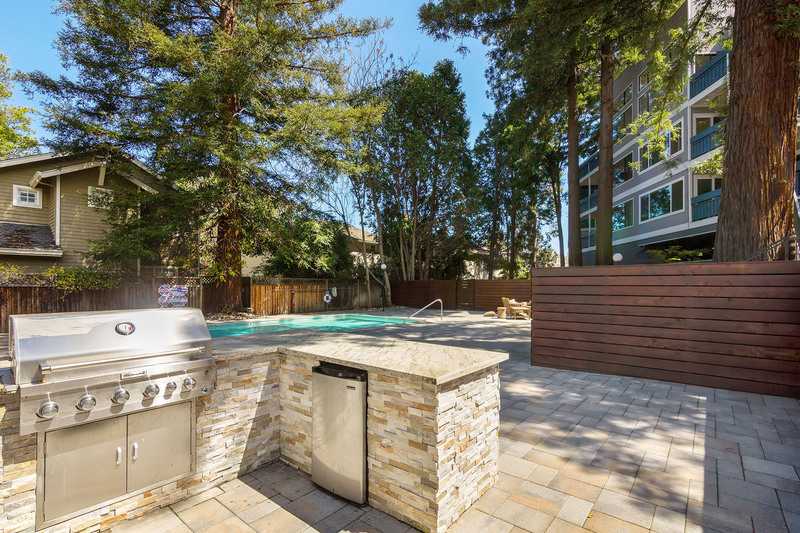 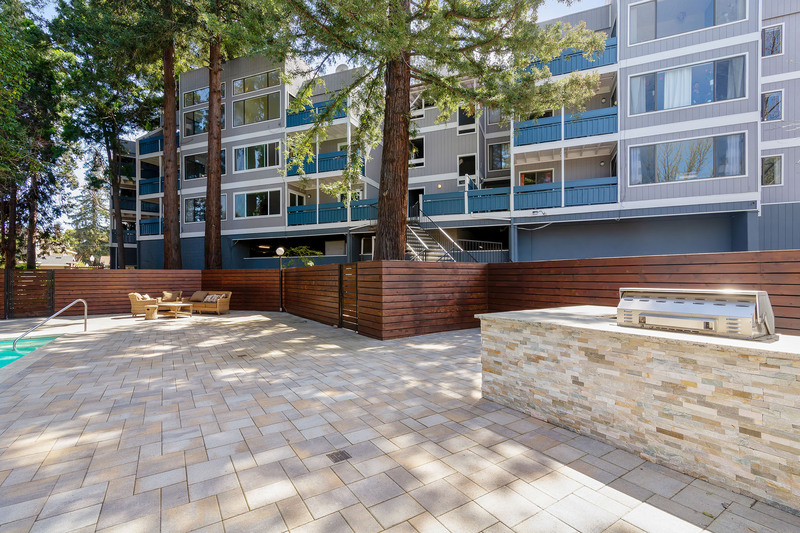 The Google campuses, Linkedin, Microsoft, Intuit, and the famous Shoreline Amphitheatre are all just a few minutes away from your new condo. 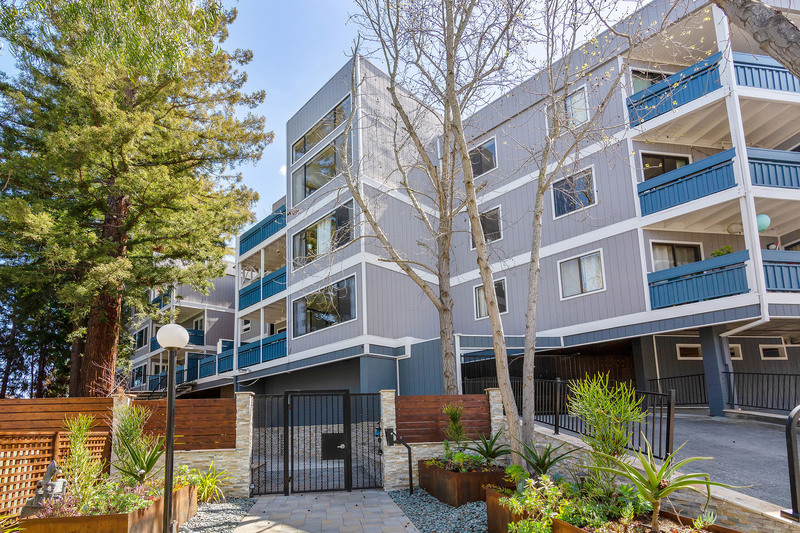 Enjoy the trails along Permanente Creek just a few blocks away from your doorstep. 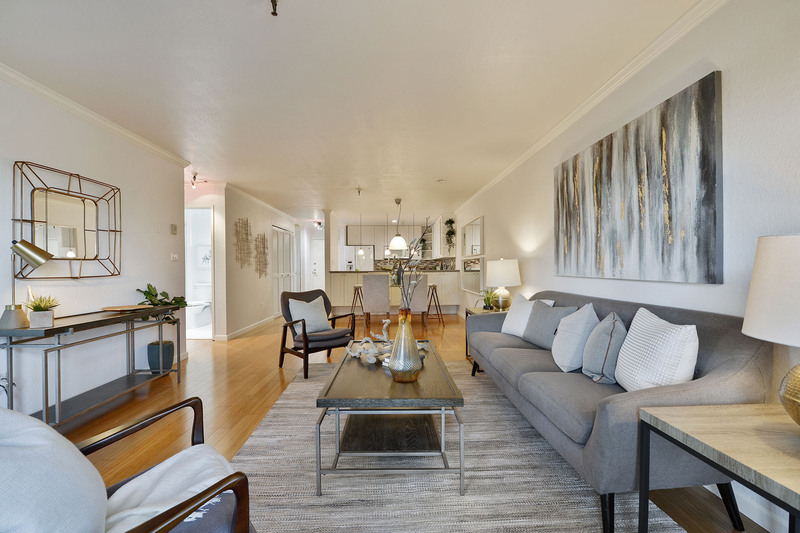 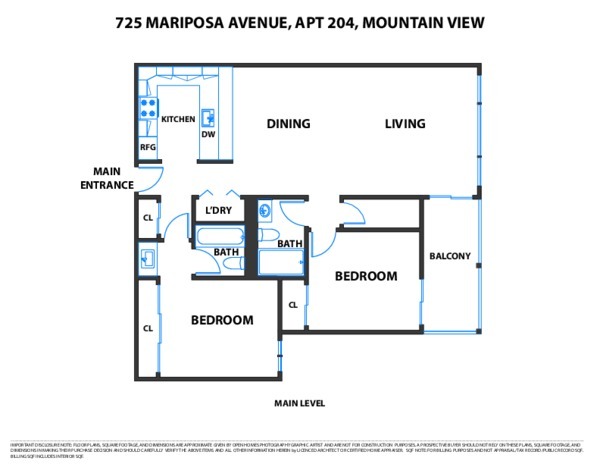 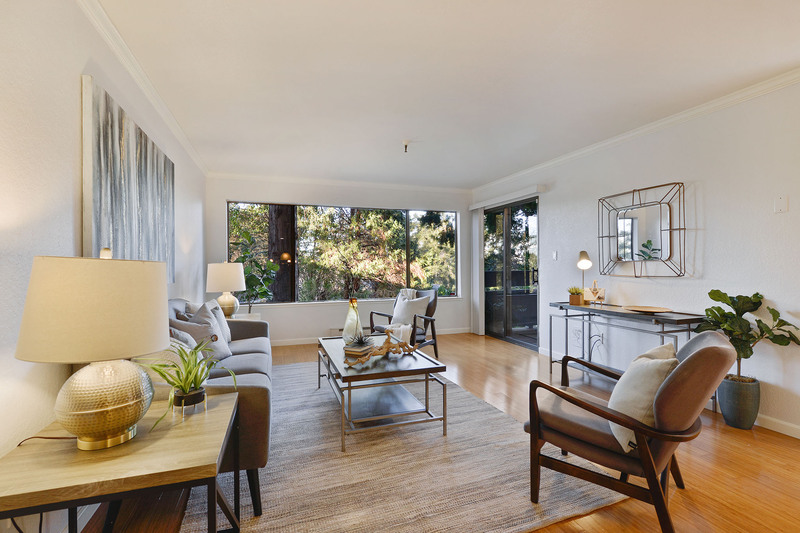 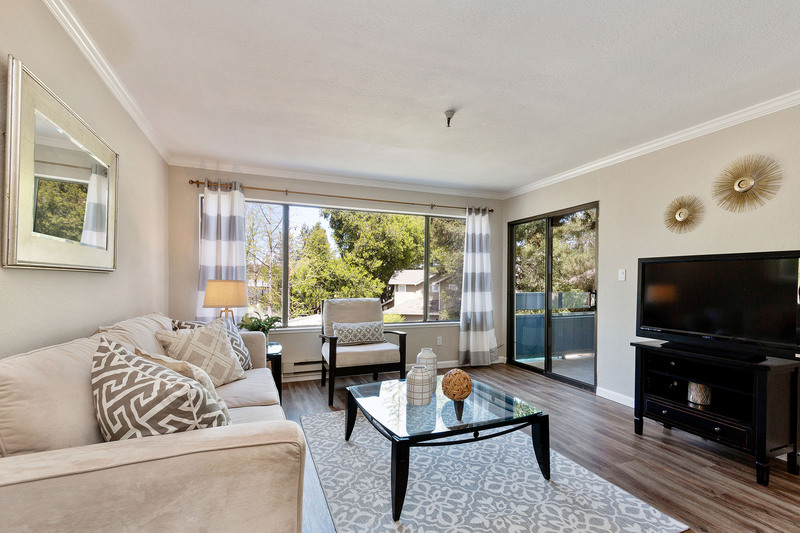 Come see your new home in the Mariposa Heights Condominiums before it’s too late.